Sidebar: General Lemuel C. Shepherd, Jr.
With the instantaneous opening of a two-hour, ever-increasing bombardment by six battleships, nine cruisers, a host of destroyers and rocket ships, laying their wrath on the wrinkled black hills, rice paddies, cliffs, and caves that faced the attacking fleet on the west side of the island, Liberation Day for Guam began at 0530, 21 July 1944. Fourteen-inch guns belching fire and thunder set spectacular blossoms of flame sprouting on the fields and hillsides inland. It was all very plain to see in the glow of star shells which illuminated the shore, the ships, and the troops who lined the rails of the transports and LSTs (Landing Ships, Tank) which brought the U.S. Marines and soldiers there. The barrages, which at daylight would be enlarged by the strafing and bombing of carrier fighters, bombers, and torpedo planes, were the grand climax of 13 days (since 8 July) of unceasing prelanding softening-up. Indeed, carrier aircraft of Task Force 58 had been blasting Guam airfields since 11 June, while the first bombardment of the B-24s and B-25s of the Fifth, Seventh, and Thirteenth Air Forces fell as early as 6 May. Up at 0230 to a by-now traditional Marine prelanding breakfast of steak and eggs, the assault troops, laden with fighting gear, sheathed bayonets protruding from their packs, hurried and waited, while the loudspeakers shouted “Now hear this.... Now hear this.” Unit commanders on board the LSTs visited each of their men, checking gear, straightening packs, rendering an encouraging pat on a shoulder, and squaring away the queues going below to the well decks before boarding the LVTs (Landing Vehicles, Tracked). Troops on the APAs (attack transports) went over the rail and down cargo nets to which they—weighed down with 40-pound packs as well as weapons—held on for dear life, and into LCVPs (Landing Craft, Vehicle and Personnel). These troops would transfer from the landing craft to LVTs at the reef’s edge, if all went as planned. You have been honored. The eyes of the nation watch you as you go into battle to liberate this former American bastion from the enemy. The honor which has been bestowed on you is a signal one. May the glorious traditions of the Marine Corps’ esprit de corps spur you to victory. You have been honored. In the crowded, stifling well decks of the LSTs, the liberators climbed on board the LVTs and waited claustrophobic until the LST bow doors dropped and the tracked landing vehicles rattled out over these ramps into the swell of the sea. As the amphibian tractors circled (about 0615) near the line of departure, a flight of attack aircraft from the Wasp drowned out the whine of the amtrac engines and whirled up clouds of fire and dust, obscuring the landing beaches ahead. Eighty-five fighters, 65 bombers, and 53 torpedo planes executed a grass-cutting strafing and bombing sweep along all of the landing beaches from above the2 northern beaches of Agana, south for 14 miles to Bangi Point. “My aim is to get the troops ashore standing up,” said Rear Admiral Richard L. Conolly, Southern Attack Force (Task Force 53) commander, who earned the nickname “Close-in Conolly” during the Marshalls operations for his insistence on having his naval gunfire support ships firing from stations very close to the beaches. The next best thing to a welcome mat for Marine assault waves had been laid by the audacious Navy Underwater Demolition Teams 3, 4, and 6, who cleared the beach obstacles. Navy Chief Petty Officer James R. Chittum of Team 3 noted that these pathfinders were usually close enough to draw small arms fire. At Asan, they exploded 640 wire obstacle cages filled with cemented coral, and at Agat they blew a 200-foot hole for unloading in the coral reef. Team 3, under Navy Reserve Lieutenant Thomas C. Crist, also removed half of a small freighter from a channel blocking the way of the Marines. At 0730 a flare was shot in the air above the waiting flotilla and Admiral Conolly commanded: “Land the Landing Force.” At 0808, the first wave of the 3d Marine Division broke the circle of waiting LVTs to form a line and cross the 2,000 yards of water to the 2,500-yard-wide beach between Asan and Adelup points. At 0829, the first elements of the 3d Marine Division were on Guam. 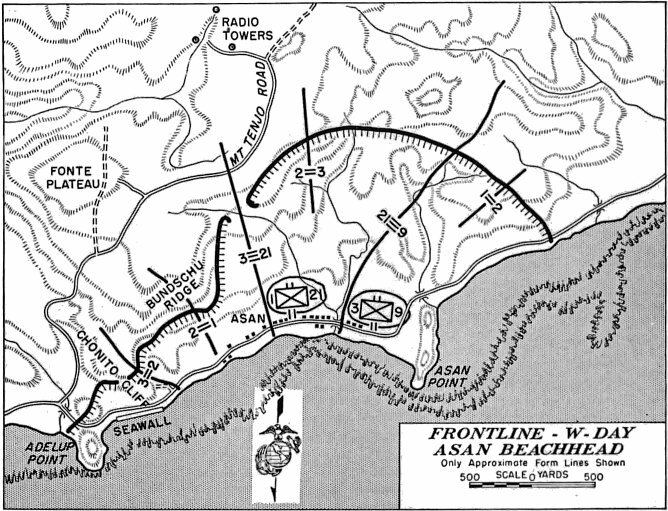 Three minutes later, 0832, lead assault troops of the 1st Provisional Marine Brigade crossed the shelled-pocked strand at Agat, six miles south of the Asan-Adelup beachhead. Major General Roy S. Geiger, as the other general officers in the Guam invasion force, was a World War I veteran. He also was an early Marine Corps aviator. He was the fifth Marine to become a naval aviator—in 1917—and the 49th in the naval service to obtain his wings. He went to France in July of that year and commanded a squadron of the First Marine Aviation Force. In the war and after, he saw service with Marine Corps air units. He also was well educated professionally, for he attended the Army Command and General Staff School at Fort Leavenworth in 1924–1925 and was a student in the Senior and Advanced Courses at the Naval War College, Newport, Rhode Island, 1939–1941. In August 1941, he became commanding general of the 1st Marine Aircraft Wing and led it at Guadalcanal during the difficult days from September to November 1942. Back in Washington in 1943, he was Director of Aviation, until, on the untimely death of Major General Charles D. Barnett, Commanding General, I Marine Amphibious Corps, just prior to the Bougainville landings, General Geiger was rushed out to the Pacific to assume command and direct the landings at Empress Augusta Bay on 1 November 1943. He was the first Marine aviator to head as large a ground command as IMAC, which was redesignated III Amphibious Corps in April 1944. He led this organization in the liberation of Guam in July 1944, and in the landings on Peleliu on 15 September 1944. General Geiger led this corps into action for the fourth time as part of the Tenth Army in the invasion of Okinawa. Upon the death of Army Lieutenant General Simon B. Buckner, Geiger took command of the Tenth Army, the first Marine to lead an army-sized force. 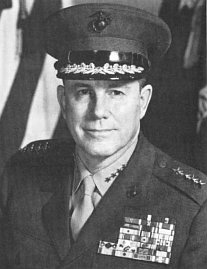 In July 1945, at the end of the Okinawa operation, General Geiger assumed command of Fleet Marine Force, Pacific, at Pearl Harbor. In November 1946 he returned to Headquarters, U.S. Marine Corps, in Washington, and died the following year. By an act of Congress, he was posthumously promoted to the rank of general. Guam, along with the Philippines, became a territorial possession of the United States with the signing of the Treaty of Paris in 1899, ending the Spanish-American War. Earlier, on 21 June 1898, First Lieutenant John Twiggs “Handsome Jack” Myers had led a party of Marines ashore from the protected cruiser Charleston to accept the surrender of the Spanish authorities, who didn’t know that a state of war then existed between Spain and the United States. Thus began a long Marine presence on Guam. The island, southernmost of3 the Marianas chain, was discovered by Ferdinand Magellan in 1521, but not occupied until 1688 when a small mission was established there by a Spanish priest and soldiers. When control of the rest of the Mariana Islands, including Saipan and Tinian, all once German possessions, was given to Japan as a mandate power in 1919, Guam became an isolated and highly vulnerable American outpost in a Japanese sea. This American territory, 35 miles long, nine miles at its widest and four at its narrowest, shaped like a peanut, with a year-long mean temperature of 79 degrees, fell quickly and easily in the early morning of 10 December 1941. Much of the Japanese attack on Guam came from her sister island of Saipan, 150 miles to the north. The governor of Guam, Captain George J. McMillan (the island governor was always a U.S. Navy officer), aware that he could expect no reinforcement or relief, decided to surrender the territory to Japanese naval forces. Foremost in his mind was the fate of the 20,000 Guamanians, all American nationals, who would inevitably suffer if a strong defense was mounted. He felt “the situation was simply hopeless.” He sent word to the 153 Marines of the barracks detachment at Sumay on Orote Peninsula and the 80-man Insular Guard to lay down their arms. Even so, in two days of bombing and fighting, the garrison lost 19 men killed and 42 wounded, including four Marines killed and 12 wounded. 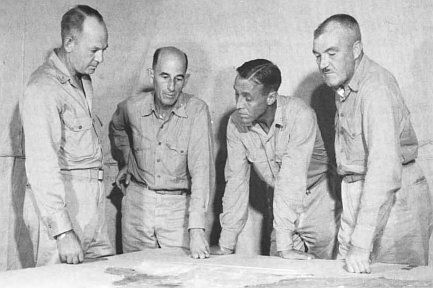 RAdm Richard L. Conolly, Southern Attack Force commander for the Guam landings, confers on Guadalcanal with the commanders of the Northern Attack Group during rehearsals prior to the departure for the Marianas target. From left to right: BGen Alfred H. Noble, assistant division commander, 3d Marine Division; Cdr Patrick Buchanan, USN, commander, Northern Transport Group; Adm Conolly; MajGen Allen Turnage, commanding general, 3d Marine Division. In late 1943, both the Joint Chiefs of Staff (JCS) and, later, the Combined Chiefs of Staff (CCS) agreed to the further direction of the Pacific War. General Douglas MacArthur, commander of the Southwest Pacific Area, was to head north through4 New Guinea to regain the Philippines. Admiral Chester W. Nimitz, Commander in Chief, U.S. Pacific Fleet, and Pacific Ocean Areas (CinCPac/CinCPOA), proposed a move through the Central Pacific to secure a hold in the Marianas. The strategic bombing of Japan would originate from captured fields on Guam, Saipan, and Tinian. The new strategic weapon for these attacks would be the B-29 bomber, which had a range of 3,000 miles while carrying 10,000 pounds of bombs. The code name of the Marianas operation was “Forager.” The Central Pacific drive began with the landing on Tarawa in November 1943, followed by the landings in Kwajalein Atoll on Roi-Namur, Eniwetok, and Kwajalein itself. In January 1944, Admiral Nimitz made final plans for Guam, and selected his command structure for the Marianas campaign. Accordingly, Admiral Raymond A. Spruance, the victor at Midway, was designated commander of the Fifth Fleet and of all the Central Pacific Task Forces; he would command all units involved in Forager. Vice Admiral Richmond K. Turner, who had commanded naval forces for the landings at Guadalcanal and Tarawa, headed the Joint Expeditionary Force (Task Force 51). Turner would also command the Northern Attack Force for the invasion of Saipan and Tinian. Admiral Conolly,5 who had commanded the invasion forces at Roi and Namur in the Marshalls, would head the Southern Attack Force (Task Force 53) assigned to Guam. 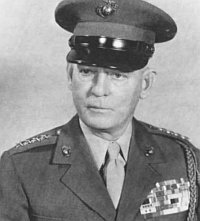 Marine Major General (later Lieutenant General) Holland M. Smith, the Expeditionary Troops commander for the Marianas, would be responsible for the Northern Troops and Landing Force at Saipan and Tinian, essentially the Marine V Amphibious Corps (VAC). Major General Roy S. Geiger, an aviator who had conducted the Bougainville operation, was to command the Southern Troops and Landing Force, the III Amphibious Corps, at Guam. D-Day for the invasion of Saipan had been set for 15 June. It was an important date also for the 3d Marine Division, commanded by Major General Allen H. “Hal” Turnage; the 1st Provisional Marine Brigade under Brigadier General Lemuel C. Shepherd, Jr.; and the Army’s 77th Infantry Division under Major General Andrew D. Bruce. 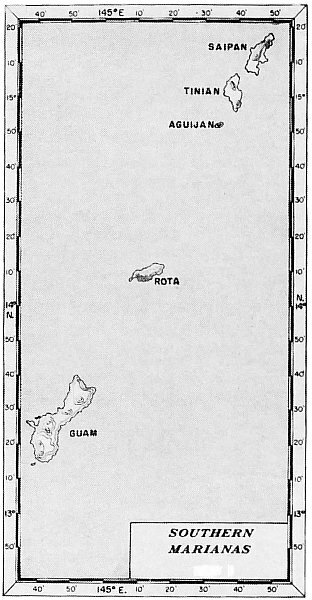 They were to land on Guam on 18 June, but the 3d Division and the brigade first would wait as floating reserve until the course of operations on Saipan became clear. The 77th would stand by on Oahu, ready to be called forward when needed. Admiral Spruance kept the floating reserve well south and east of Saipan, out of the path of an expected Japanese naval attack. A powerful Japanese fleet, eager to close with the American invasion force, descended upon the Marianas. The opposing carrier groups clashed nearby in the Battle of the Philippine Sea, one of the major air battles of the war. The Imperial Navy lost 330 out of the 430 planes it launched in the fray. The clash (19 June), called “the Great Marianas Turkey Shoot,” was catastrophic for the Japanese and ended once and for all any naval or air threat to the Marianas invasion. With the hard fighting on Saipan turning gradually but inevitably in favor of the American Marines and soldiers battling the Japanese, the U.S. Navy was ready to direct its attention to Guam, which was now slated to receive the most thorough pre-landing bombardment yet seen in the Pacific War. After weeks at sea, the 3d Division and the 1st Brigade were given a respite and a chance to go ashore to lose their “sea legs” after so long a period on board ships. The Task Force 53 convoy moved back to Eniwetok Atoll, whose huge 20-mile-wide lagoon was rapidly becoming a major forward naval base. The Marines welcomed the break and the chance to walk on dry land on the small islands of the atoll. There was even an issue of warm beer to all those on shore. The Marine veterans of the fighting on Bougainville, New Georgia, and Eniwetok had a chance to look over the soldiers of the 305th Regimental Combat Team, which now came forward6 from Oahu to be attached briefly to the brigade for the landing on Guam, set for 21 July and designated W-Day. The rest of the Army contingent, the 77th Infantry Division, was well trained and well led, and was scheduled to arrive at the target on W plus 1, 22 July. 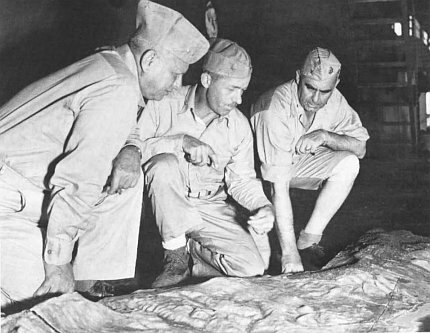 BGen Lemuel C. Shepherd, Jr., Commanding General, 1st Provisional Marine Brigade and his principal officers, from left, Col John T. Walker, brigade chief of staff; LtCol Alan Shapley, commander, 4th Marines; and Col Merlin T. Schneider, commander, 22d Marines, view a relief map of Guam for the brigade’s operation. The 3d Marine Division, composed of the 3d, 9th, and 21st Marines (rifle regiments), the 12th Marines (artillery), and the 19th Marines (engineers and pioneers), plus supporting troops, numbered 20,238 men. It had received its baptism of fire on Bougainville in November and December 1943 and spent the intervening months on Guadalcanal training and absorbing casualty replacements. 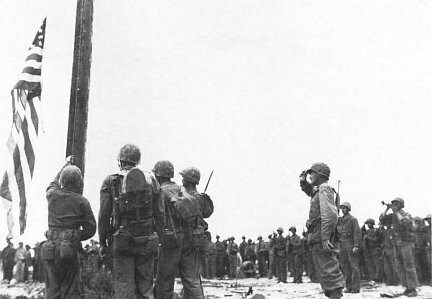 The 1st Provisional Marine Brigade, which was organized on Guadalcanal, was also a veteran outfit. One of its infantry regiments, the 4th Marines, was formed from the disbanded raider battalions which had fought in the Solomons. 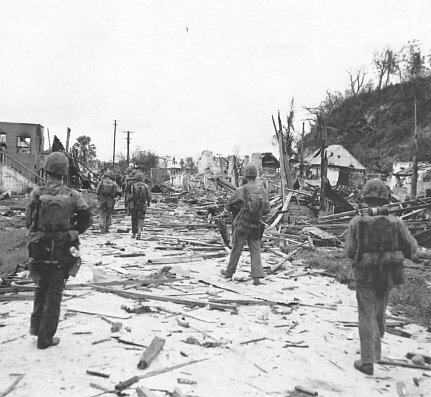 The other once-separate regiment, the 22d Marines, was blooded in the seizure of Eniwetok in February 1944. Both regiments had 75mm pack howitzer battalions attached, which now joined brigade troops. In all, the brigade mustered 9,886 men. Corps troops of the III Corps was heavy with artillery and would use every gun. 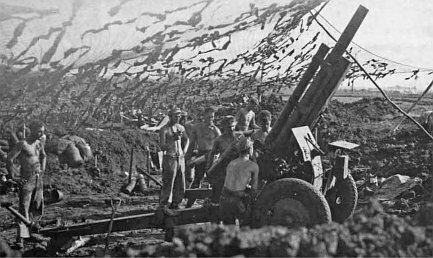 III Corps had three battalions of 155mm howitzers and guns and the 9th and 14th Defense Battalions, whose 90mm guns could and would fire at both air and ground targets. For the handling of casualties, III Corps had a medical battalion, with equipment and supplies to operate a 1,500-bed hospital. In addition, the 1st Brigade had two medical companies; the 3d Division its own medical battalion; and the 77th Division a fully staffed and equipped Army field hospital. Each of the divisions had a medium tank battalion and a full complement of engineers, augmented by two Marine separate engineer battalions and two naval construction battalions (Seabees). Two amphibian tractor battalions and an armored amphibian battalion would carry the assault waves to shore. All in all, the III Amphibious Corps was prepared to land more than 54,000 soldiers, sailors, and Marines. En route to Guam on board the command ship USS Appalachian (AGC 1), Marine III Amphibious Corps commander, MajGen Roy S. Geiger; his chief of staff, Col Merwin H. Silverthorn; and the Corps Artillery commander, BGen Pedro A. del Valle, all longtime Marines and World War I veterans, review their copy of the Guam relief map to assist in their estimates and plans for the operation. Waiting for the attack and sure7 that it would come, but not where, was the Japanese 29th Infantry Division under Lieutenant General Takeshi Takashina. The 29th had served in Japan’s Kwantung Army, operating and training in Manchuria until it was sent to the Marianas in February 1944. One of its regiments, the 18th, fell victim to an American submarine, the Trout, and lost 2,200 of its 3,500 men when its transport was sunk. Reorganized on Saipan, the 18th Infantry Regiment took two infantry battalions to Guam, together with two companies of tanks. Imperial Japanese Army LtGen Takeshi Takashina, commander of the 29th Infantry Division, which came to Guam from Manchuria in early 1944, where it was part of the Kwantung Army, was killed on 28 July while directing the evacuation of his Fonte defenses. Another of the 29th’s regiments garrisoned Tinian and the remaining unit, the 38th Infantry, together with division headquarters troops, arrived on Guam in March. 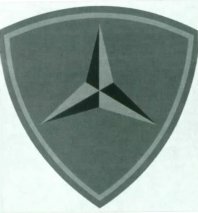 The other major Army defending units were the 48th Independent Mixed Brigade and the 10th Independent Mixed Regiment, both formed on Guam in March from a six-battalion infantry, artillery, and engineer force sent from the Kwantung Army. With miscellaneous supporting troops, the total Army defending force numbered about 11,500 men. Added to these were 5,000 naval troops of the 54th Keibitai (guard force) and about 2,000 naval airmen reorganized as infantry to defend Orote Peninsula and its airfield. 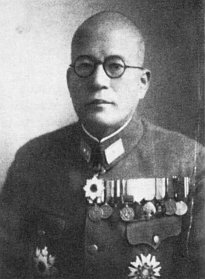 General Takashina was in overall tactical command of the 18,500 Army and Navy defenders. His immediate superior, Lieutenant General Hideyoshi Obata, commanding the Thirty-first Army, was also on Guam, though not intentionally. 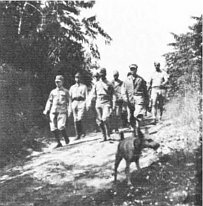 Returning to his Saipan headquarters from an inspection trip to the Palau Islands, Obata was trapped on Guam by the American landing on Saipan. He left the conduct of Guam’s defense to Takashina. The fact that the Americans were to assault Guam was no secret to its defenders. The invasion of Saipan and a month-long bombardment by ships and planes left only the question of when and where. With only 15 miles of potential landing beaches along the approachable west coast, the Japanese could not be very wrong no matter where they defended. LtGen Hideyoshi Obata, Thirty-first Army commander, who took command of the defense of Guam after Gen Takashina’s death, was himself killed by soldiers of the 306th Infantry, when they overran the Mataguac command post. Allan H. Turnage was commissioned in 1913, and went to France as commanding officer of the 5th Machine Gun Battalion, 5th Brigade of Marines. In the interwar period, Turnage had an assortment of assignments to sea duty and to duty overseas, and in 1935 he reported as director of The Basic School, then at the Philadelphia Navy Yard. At the outset of World War II, he commanded Camp Lejeune and its training center, which was responsible for the organization and training of two regimental combat teams slated for duty with the 3d Marine Division. In October 1942 he became assistant division commander of the 3d Marine Division and its commander the next September. General Turnage led the division in the landing on Bougainville and the liberation of Guam. Following the end of the war, he became Assistant Commandant of the Marine Corps. Lieutenant General Turnage’s final assignment was command of Fleet Marine Force, Pacific, at Pearl Harbor. Upon his retirement in 1948, because he was decorated in combat, he received a fourth star. He died in October 1971. Lemuel C. Shepherd, Jr., was in his senior year at the Virginia Military Institute and had not yet graduated when he was commissioned in the Marine Corps. He sailed to France as a member of the 5th Regiment of Marines, part of the 4th Brigade of Marines. He saw considerable action in the war—he was wounded twice at Belleau Wood and after recovering from his wounds and rejoining his regiment for the St. Mihiel and Meuse-Argonne offensives, he was wounded for a third time in the latter. Shepherd served in the Army of Occupation in Germany, and on his return home, became aide to the Commandant and at the White House. During the interwar period, he had a mix of school, staff, and command assignments. In March 1942, he assumed command of the 9th Marines and took it overseas as part of the 3d Marine Division. 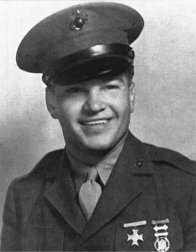 Upon promotion to flag rank in July 1943, he was assigned to the 1st Marine Division as assistant division commander and, as such, participated in the Cape Gloucester operation. He assumed command of the 1st Provisional Marine Brigade in May 1944, and led it in the landing on Guam. Following this operation, he received his second star and took command of the 6th Marine Division, which was formed from the brigade and participated in the landings on Okinawa. 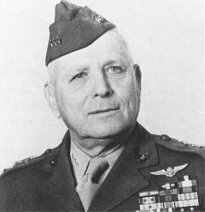 General Shepherd commanded Fleet Marine Force, Pacific, in the first two years of the Korean War, and then was chosen as the 20th Commandant of the Marine Corps. General Shepherd died at the age of 94 in 1990. Andrew D. Bruce, a native of Missouri and a graduate of Texas A&M in 1916, was commissioned an Army second lieutenant in June 1917. His association with the Marine Corps goes back to World War I, when as a member of the 2d Infantry Division’s 5th Machine Gun Battalion, he participated in actions in France in the Troyon Sector near Verdun, in the Aisne Defensive operation near Chateau Thierry, the Aisne-Marne offensive at Soissons, the fighting at St. Mihiel, and the Meuse-Argonne offensive at Blanc Mont. With the rest of the 2d Division, he hiked into Germany to become part of the occupation force. In the interwar period, he had a mix of staff, command, and school assignments. At the outbreak of World War II, then-Lieutenant Colonel Bruce headed the Army’s Tank Destroyer School, which was first at Camp Meade, Maryland, then at Camp Hood near Kileen, Texas. He assumed command of the 77th Infantry Division in May 1943. The division first saw combat at Guam with the 3d Marine Division and the 1st Provisional Marine Brigade, and then landed at Leyte for the Philippines operation. 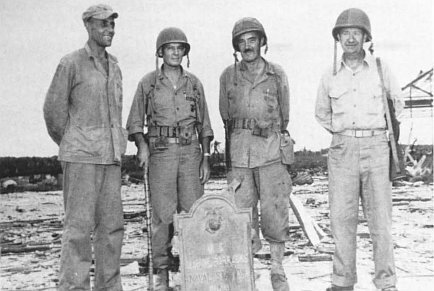 General Bruce’s 77th once again fought with Marines in the landing on 1 April 1945 on Okinawa. When the XXIV Corps attacked to the south, General Bruce’s soldiers and the 1st Marine Division were neighbors in the frontlines. General Bruce retired with three stars as a lieutenant general and died in 1969. Troops of the 3d Marine Division landed virtually in the lap of the Japanese island commander, General Takashina, whose U-shaped cave command post, carved out of a sandstone cliff, overlooked the Asan-Adelup beachhead. The looming heights dominated the beaches, particularly on the left and center, where the 3d and 21st Marines were headed for the shore. The 3d Marines under Colonel W. Carvel Hall struck on the far left of the 2,500-yard beachhead, the left flank of the division near Adelup Point. Ahead was Chonito Cliff, a ridge later named Bundschu Ridge, and high, difficult ground in back of which was the final beachhead line (FBHL), or first goal of the landing. The center, straight up the middle, belonged to the 21st Marines, under Colonel Arthur H. “Tex” Butler. The regiment would drive inland, secure a line of cliffs, and defend them until the division caught up and was ready to expand the beachhead outward. Under Colonel Edward A. Craig, the 9th Marines landed on the right flank near Asan Point, ready to strike inland over paddies to and across lower and more hospitable hills, but all part of the same formidable enemy-held ridgeline. 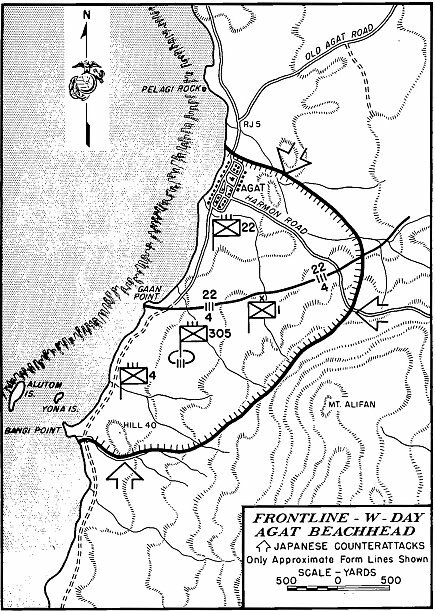 The 3d Battalion, 9th Marines, under Lieutenant Colonel Walter Asmuth, Jr., caught intense fire from the front and right flank near Asan Point, and he had to call on tanks for assistance, but one company got to9 the ridge ahead quite rapidly and threw the defenders at Asan Point off balance, making the regiment’s advance easier. (It would also be up to the 9th Marines to take Cabras, a little island offshore and hard against Apra Harbor. This would be accomplished with a separate amphibious landing.) With its 2d and 3d Battalions in the lead, the 9th Marines drove through its initial objectives quickly and had to slacken its advance in order not to thin out the division’s lines. Colonel Butler’s 21st Marines, in a stroke of luck which would later be called unbelievable, found two unguarded defiles on either side of the regiment’s zone of action. His troops climbed straight to the clifftops. No attempt was made to keep contact going up, but, on top, the 2d and 3d Battalions formed a bridge covering both defiles. The 1st Battalion swept the area below the cliffs. On the far left, the 3d Marines was getting the worst of the enemy’s increasing resistance. The regiment received intense mortar and artillery fire coming in and on the beaches, and faced the toughest terrain—steep cliffs whose approaches were laced with interlocking bands of Japanese machine gun fire. The cliffs were defended by foes who knew and used their weapons well. The Japanese, that close, would roll grenades right down the escarpment onto the Marines. Snipers could find protection and cover in the countless folds and ridges of the irregular terrain, and the ridgetops were arrayed like the breastworks of some nightmarish castle. It appeared that ten on top could hold off hundreds below. Laden amphibious tractors carry troops of the 22d Marines in the assault wave to Yellow Beaches 1 and 2 south of Agat in the Southern Sector. Here, they would face murderous fire from Japanese guns at Gaan Point and from positions overlooking the beaches on Mount Alifan and Maanot Ridge. Gaan Point was not fully neutralized until 1330, W-Day. One of the defenders, Lieutenant Kenichi Itoh, recalled that despite the terrible bombardment, he felt secure, that his countrymen could hold out for a long time, even win. After the war, recalling his feelings that eventful day in July 1944, the lieutenant considered it all a bad dream, “even10 absurd” to think that his forces could ever withstand the onslaught. Upon reaching the beach, Marines quickly unload over the gunwales of the amtrac which brought them in and rushed off the beaches. As the frontlines advanced, succeeding waves of amphibian tractors will carry the troops further inland. Colonel Hall ordered the attack to continue in mid-afternoon behind a massive 81mm mortar barrage. None of the companies of Major Aplington’s battalion or Lieutenant Colonel Hector de Zayas’ 2d Battalion could gain any ground beyond what they already precariously held. Their opponent, the 320th Independent Infantry Battalion held fast. When the 1700 attack went off, it was no change. E made little progress and the gallant men of A Company attacked again and again, reached the top but could not hold. Geary Bundschu was killed and the company slid back to the former positions. In the morning light of 22 July (W plus 1), that small but formidable Japanese position still held firmly against the 3d Marines’ advance. During the bitter fighting of the previous day, Private First Class Luther Skaggs, Jr., of the 3d Battalion, led a mortar section through heavy enemy fire to support the attack, then defended his position against enemy counterattacks during the night although badly wounded. For conspicuous gallantry and bravery beyond the call of duty, he was awarded the Medal of Honor. 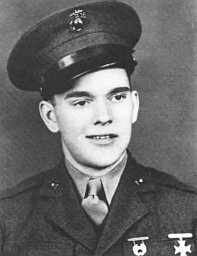 On the 22d, Private First Class Leonard F. Mason, a Browning automatic rifleman of the 2d Battalion, earned a posthumous Medal of Honor for single-handedly attacking and wiping out an enemy machine gun11 position which threatened his unit. Although wounded severely, he rejoined his fellow Marines to continue the attack, but succumbed to his fatal wounds. Seen from the air, 9th and 21st Marines assault Green and Blue Beaches in the Northern Sector on 21 July, W-Day. In the right, Asan Point casts a foreboding shadow over that portion of the landing area. Note LSTs beaching at the left. During the day’s bitter fighting, Colonel Hall tried to envelop the Japanese, using Companies A and C of Aplington’s battalion and Company E of de Zayas’. On regimental orders, Aplington kicked it off at 1150. It also got nowhere at first. Company A got to the top but was thrown off. Company E was able to move ahead very slowly. Probe after probe, it found Japanese resistance perceptibly weakening. By 1900, the men of E reached the top, above Company A’s position. The Japanese had pulled back. In the morning, a further advance confirmed the enemy withdrawal. 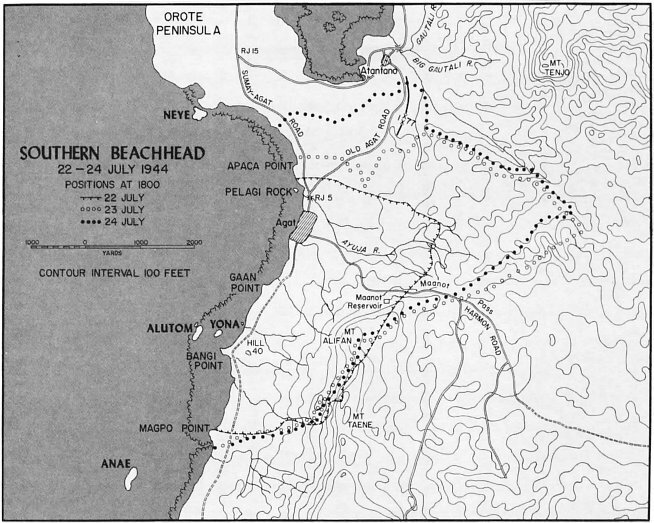 In the south at Agat, despite favorable terrain for the attack, the 1st Brigade found enemy resistance at the beachhead to be more intense than that which the 3d Division found on the northern beaches. Small arms and machine gun fire, and the incessant fires of two 75mm guns and a 37mm gun from a concrete blockhouse with a four-foot thick roof built into the nose of Gaan Point, greeted the invading Marines as the LVTs churned ashore. The structure had been well camouflaged and not spotted by photo interpreters12 before the landing nor, unfortunately, selected as a target for bombing. As a result, its guns knocked out two dozen amtracs carrying elements of the 22d Marines. For the assault forces’ first hours ashore on W-Day on the southern beaches, the Gaan position posed a major problem. 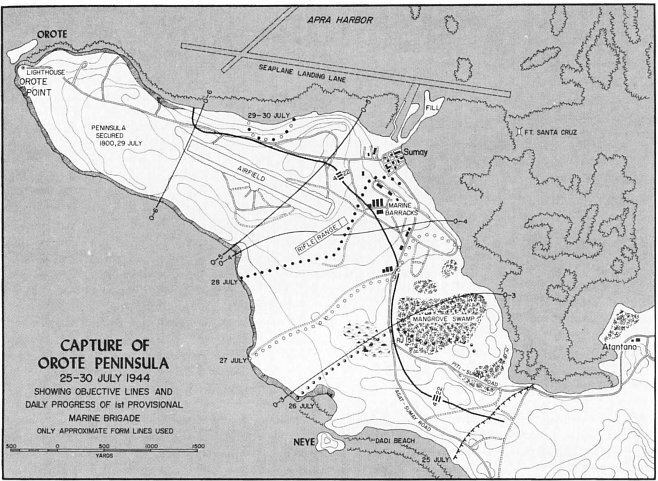 The assault at Agat was treated to the same thunderous naval gunfire support which had disrupted and shook the ground in advance of the landings on the northern beaches at Asan. When the 1st Brigade assault wave was 1,000 yards from the beach, hundreds of 4.5-inch rockets from LCI(G)s (Landing Craft, Infantry, Gunboat) slammed into the strand. It would be the last of the powerful support the troops of the brigade in assault would get before they touched down on Guam. While the LVTs, the DUKWs (amphibious trucks), and the LCVPs were considerably off shore, there was virtually no enemy fire from the beach. An artillery observation plane reported no observed enemy fire. The defenders at Agat, however, 1st and 2d Battalions, 38th Infantry, would respond in their own time. The loss of so many amtracs as the assault waves neared the beaches meant that, later in the day, there would not be enough LVTs for the transfer of all supplies and men from boats to amtracs at the Agat reef. This shortage of tractors would plague the brigade until well after W-Day. The damage caused to assault and cargo craft on the reef, and the precision of Japanese guns became real concerns to General Shepherd. Some of the Marines and most of the soldiers who came in after the first assault waves would wade ashore with full packs, water to the waist or higher, facing the perils of both underwater shellholes and Japanese fire. Fortunately, by the time the bulk of the 77th Division waded in, these twin threats were not as great because the Marines ashore were spread out and keeping the Japanese occupied. 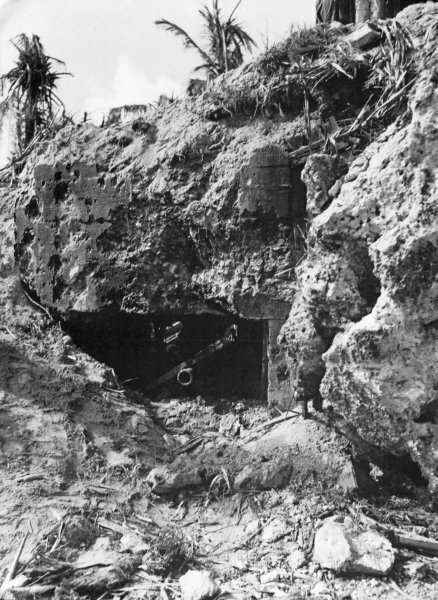 The Japanese Agat command had prepared its defenses well with thick-walled bunkers and smaller pillboxes. The 75mm guns on Gaan Point were in the middle of the landing beaches. 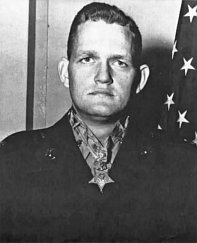 Crossfire from Gaan coordinated with the machine guns on nearby tiny Yona island to rake the beaches allocated to the 4th Marines under Lieutenant Colonel Alan Shapley. The 4th Marines was to establish its beachhead, and protect the right or southernmost flank. After bitter fighting, the 4th Marines forged ahead on the low ground to13 its front and cleared Bangi Point where bunker walls could withstand a round from a battleship. Lieutenant Colonel Shapley set up a block on what was to be known as Harmon Road leading down from the mountains to Agat. A lesson well learned in previous operations was that the Japanese would be back in strength and at night. In quick order, the 105mm howitzers of LtCol Alpha L. Bowser’s 3d Battalion, 12th Marines, were landed and set up in camouflaged positions to support the attack. When the Marines landed, they found an excellent but undermanned Japanese trench system on the beaches, and while the pre-landing bombardment had driven enemy defenders back into their holes, they nonetheless were able to pour heavy machine gun and mortar fire down on the invaders. Pre-landing planning called for the Marine amtracs to drive 1,000 yards inland before discharging their embarked Marines, but this tactic failed because of a heavily mined beachhead, with its antitank ditches and other obstacles. However, the brigade attack ashore was so heavy, with overwhelming force the Marines were able to break through, and by 1034, the assault forces were 1,000 yards inland, and the 4th Marines’ reserve battalion had landed. 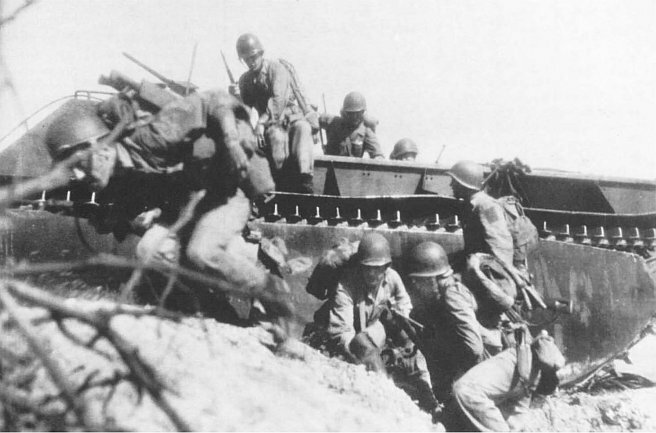 After receiving extremely heavy fire from all emplaced Japanese forces, the Marines worked on cleaning out bypassed bunkers together with the now-landed tanks. By 1330, the Gaan Point blockhouse had been eliminated by taking the position from the rear and blasting the surprised enemy gunners before they could offer effective resistance. At this time also, the brigade command group was on the beach and General Shepherd had opened his command post. The 22d Marines, led by Colonel Merlin F. Schneider, was battered by a hail of small arms and mortar fire on hitting its assigned beach, and suffered heavy losses of men and equipment in the first minutes. Private First Class William L. Dunlap could vouch for the high casualties. The dead, Dunlap recalled, included the battalion’s beloved chaplain, who had been entrusted with just about everybody’s gambling money “to hold for safekeeping,” the Marines never for a minute considering that he was just as mortal as they. 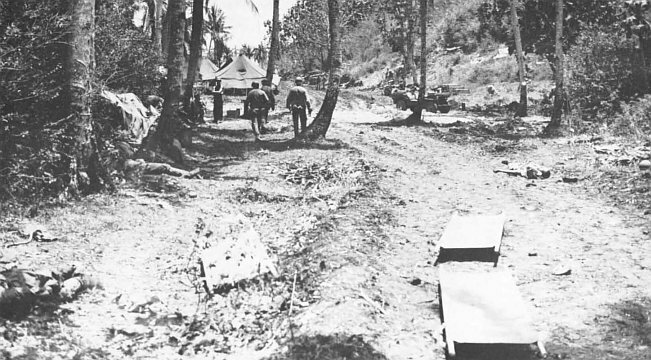 The 1st Battalion, 22d Marines (Lieutenant Colonel Walfried H. Fromhold), had left its section of the landing zone and moved to the shattered town of Agat, after which the battalion would drive north and eventually seal off heavily defended Orote Peninsula, shortly to be the scene of a major battle. 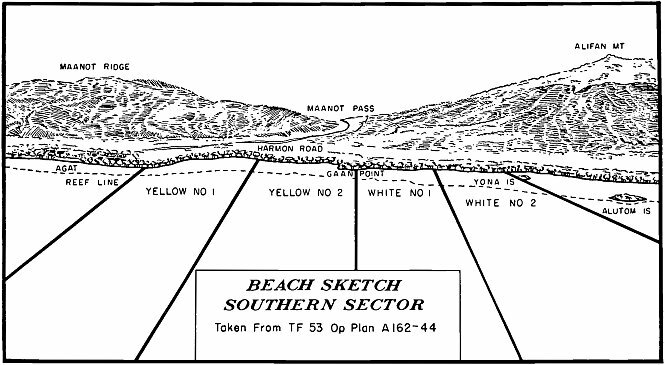 The 22d Marines’ 2d Battalion, (Lieutenant Colonel Donn C. Hart), in the center of the beachhead, quickly and easily moved 1,000 yards directly ahead inland from the beach. The battalion could have gone on to one of the W-Day goals, the local heights of Mount Alifan, if American bombs had not fallen short, halting the attack. Often, in attacking up the ridges, there was very little cover and hardly any concealment as the Marines and soldiers advanced in the face of heavy artillery, mortar, and machine gun fire. Evacuation was extremely difficult under these conditions. Company A, 3d Marines, is in a perilous position on W-Day plus 1, 22 July, as it is held up on Bundschu Ridge on its way to Chonito Ridge at the top. The troops were halted by Japanese fire, which prevented immediate reinforcement. The 1st Battalion moved into the ruins of Agat and at 1020 was able to say, “We have Agat,” although there was still small arms resistance in the rubble. By 1130 the battalion was also out to Harmon Road, which led to the northern shoulder of Mount Alifan. Even as Fromhold’s men made their advances, Japanese shells hit the battalion aid station, wounding and killing members of the medical team and destroying supplies.15 Not until later that afternoon was the 1st Battalion sent another doctor. On the right of the landing waves, Major Bernard W. Green’s 1st Battalion, 4th Marines, ran head-on into a particularly critical hill mass (Hill 40) near Bangi Point, which had been thoroughly worked over by the Navy. Hill 40’s unexpectedly heated defense indicated that the Japanese recognized its importance, commanding the beaches where troops and supplies were coming ashore. It took tanks and the support of the 3d Battalion to claim the position. Before dark on W-Day, the 2d Battalion, 22d Marines, could see the 4th Marines across a deep gully. The latter held a thin, twisted line extending 1,600 yards from the beach to Harmon Road. The 22d Marines held the rest of a beachhead 4,500 yards long and 2,000 yards deep. Helping to ensure that the Marines would stay on shore once they landed was a host of unheralded support troops who had been struggling since daylight to manage the flow of vital supplies to the beaches. Now, as17 W-Day’s darkness approached, the 4th Ammunition Company, a black Marine unit, guarded the brigade’s ammunition depot ashore. During their sleepless night, these Marines killed 14 demolition-laden infiltrators approaching the dump. A Japanese cave position on the reverse slope of Chonito Ridge offered protection for the enemy from the prelanding bombardment and enabled them to reoccupy prepared positions from which they could oppose the advance of the 3d Marines. Faulty communications delayed the order to land the Army’s 305th Regimental Combat Team (Colonel Vincent J. Tanzola), elements of the assault force, for hours. Slated for a morning landing, the 2d Battalion of Lieutenant Colonel Robert D. Adair did not get ashore until well after nightfall. As no amtracs were then available, the soldiers had to walk in from the reef. Some soldiers slipped under water into shellholes and had to swim for their lives in a full tide. The rest of the 305th had arrived on the beach, all wet, some seasick, by 0600 on W plus-1. The following is a dispatch written by Marine Combat Correspondent Private First Class Cyril J. O’Brien in the field after the combat action he describes in his story. It was released for publication in the United States sometime after the event (always after families were notified of the wounding or death of the Marines mentioned.) This story is reprinted from the carbon copy of the file which he retained of the stories he filed from the Pacific. An infantry squad, led by Second Lieutenant James A. Gallo, 24, 172 Broadway, Haverstraw, N.Y., approached to within ten yards of the tip. The crest bloomed with machine gun fire. In the face of it the Marine company tried its first assault. The company was thrown back before it had advanced forty yards. Beaten again, the company retired to a small ravine, and remained there all night. One Marine, shot through both legs, was asking for morphine. Another’s thigh was ripped by shell fragments. A PFC, his dry tongue swollen, tried to whisper the range of an enemy sniper. At eleven in the morning of the 22d, with little more than a third of their original number, the company rushed the hillside again. Lieutenant Gallo led an assault on the left flank of the hill, but he was thrown back. Sergeant Charles V. Bomar, 33, 4002 Gulf St., Houston, Tex., with nine Marines attempted to take the right ground of the slope. Five were killed as they left the ravine. The sergeant and three others reached the top of the slope. Field commanders soon came to appreciate the effect these so-called “Joe Blow” stories had on the morale of their men. The stories were printed in hometown newspapers and were clipped and sent to the troops in the Pacific, who could then see that their efforts were being publicized and appreciated at home. Colonel Tsunetaro Suenaga, commanding officer of the 38th Regiment, from his command post on Mount Alifan, had seen the Americans overwhelm his forces below. Desperate to strike back, he telephoned General Takashina at 1730 to get permission for an all-out assault to drive the Marines into the sea. He had already ordered his remaining units to assemble for the counterattack. The 29th Division commander was not at first receptive. Losses would be too high and the 38th Regiment would serve better defending the high ground and thereby threatening the American advance. Reluctantly however, Takashina gave his permission, and ordered the survivors to fall back on Mount Alifan if the attack failed, which he was certain it would. Eventually Colonel Suenaga was forced to share the general’s pessimism, for he burned his regiment’s colors to prevent their capture. Finding a gap in our lines and overrunning the machine gun which covered the gap the enemy broke through and advanced toward the beaches. Some elements turned to their left and struck Hill 40 from the rear. K Company with about 200 men fought them all night long from Hill 40 and a small hill to the rear and northeast of Hill 40. When daylight came the Marines counterattacked with two squads from L Company ... and two tanks ... and closed the gap. A number of men from Company K died that night but all 750 Japanese soldiers were killed. The hill ... represents in miniature or symbolically the whole hard-fought American victory on Guam. Along the rest of the Marine front, and in the reserve areas, the fighting was hot and heavy as the rest of the 38th attacked. Colonel Suenaga pushed his troops to attack again and again, in many cases only to see them mowed down in the light of American flares. No novice to Japanese tactics, General Shepherd had anticipated this first night’s attack and was ready. Enemy reconnaissance patrols were numerous around 2130, trying to draw fire and determine Marine positions. Colonel Suenaga was out in front of the center thrust which began at 2330 after a brisk mortar flurry on the right flank of the 4th Marines. The Japanese came on in full force, yelling, charging with their rifles carried at high port, and throwing grenades. The Marines watched the dark shadows moving across the skyline under light of star shells from the ships. Men lined up hand grenades, watched, waited, and then reacted. The Japanese were all around, attempting to bayonet Marines in their foxholes. They even infiltrated down to pack-howitzer positions in the rear of the front lines. It was the same for the 22d Marines. A whole company of Japanese closed to the vicinity of the regimental command post. The defense here was held largely by a reconnaissance platoon headed by Lieutenant Dennis Chavez, Jr., who personally killed five of the infiltrators at point-blank range with a Thompson sub-machine gun. Four enemy tanks in that same attack lumbered down Harmon Road. There they met a bazooka man from the 4th Marines, Private First Class Bruno Oribiletti. He knocked out the first two enemy tanks and Marine Sherman tanks of Lieutenant James R. Williams’ 4th Tank Company platoon finished off the rest. Oribiletti was killed; he was posthumously awarded the Navy Cross for his bravery. Enemy troops of the 38th also stumbled into the barely set up perimeter of the newly arrived 305th Infantry and paid heavily for it. After one day and night of furious battle the 38th ceased to exist. Colonel Suenaga, wounded in the first night’s counterattack, continued to flail at the Marines until he, too, was cut down. Takashina ordered the shattered remnants of the regiment north to join the reserves he would need to defend the high ground around Fonte Ridge above the Asan-Adelup beachhead. The general would leave his19 troops on Orote to fend for themselves. 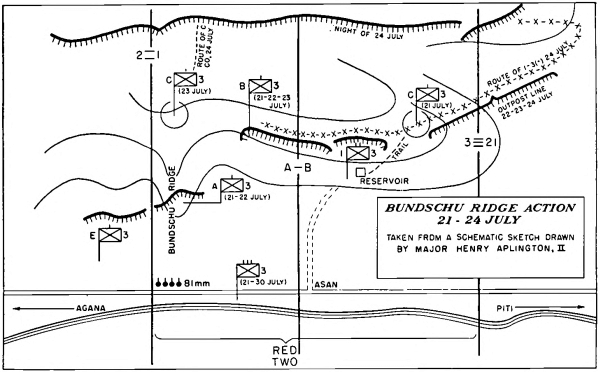 The two days of fierce fighting on the left of the 3d Division’s beachhead in the area that was now dubbed Bundschu Ridge cost the 3d Marines 615 men killed, wounded, and missing. The 21st Marines in the center held up its advance on 22 July until the 3d Marines could get moving, but the men in their exposed positions along the top of the ridge, seized so rapidly on W-Day, were hammered by Japanese mortar fire, so much so that Colonel Butler received permission to replace the 2d Battalion by the 1st, which had been in division reserve. The 9th Marines met relatively little resistance as it overran many abandoned Japanese positions in its drive toward the former American naval base at Piti on the shore of Apra Harbor. The 3d Battalion, after a heavy barrage of naval gunfire and bombs, assaulted Cabras Island in mid-afternoon, landing from LVTs to find its major obstacle dense brambles with hundreds of mines. Enemy resistance increased considerably today on Div left and center. All Bn’s of 3rd CT [combat team] have been committed in continuous attack since landing. 21st CT less 1 Bn in Div Res has been committed continuously with all units in assault. One of the assault Bn’s of 21st CT is being relieved on line by Div Res Bn today. Former is approx 40 percent depleted. Since further advance will continue to thin our lines it is now apparent that an additional CT is needed. 9th CT is fully committed to the capture of Piti and Cabras. Accordingly it is urgently recommended that an additional CT be attached this Div at the earliest practicable date. Turnage did not get the additional regiment he sought. The night of W plus 1 was relatively quiet in the 3d Division’s sector except for the 1st Battalion, 21st Marines, which repulsed a Japanese counterattack replete with a preliminary mortar barrage followed by a bayonet charge. On the 23d, III Amphibious Corps Commander, General Geiger, well aware that the majority of Japanese troops had not yet been encountered, told the 3d Division that it was “essential that close contact between adjacent units be established by later afternoon and maintained throughout the night” unless otherwise directed. Despite the order to close up and keep contact, the 3d Division was spread too thinly to hold what it had seized in that day’s advance. When it halted to set up for the night, it was found that the distance between units had widened. When night fell, the frontline troops essentially held strongpoints with gaps between them covered by interlocking bands of fire. The 3d Marines reached the high ground of Bundschu Ridge on the20 23d and searched out the remaining Japanese stragglers. It was obvious that the enemy had withdrawn from the immediate area and equally plain that the Japanese hadn’t gone far. When patrols from the 21st Marines tried to link up with the 3d Marines, they were driven back by the fire of cleverly hidden machine guns, all but impossible to spot in the welter of undergrowth and rock-strewn ravines. All across the ridges that the Marines held, there were stretches of deadly open ground completely blanketed by enemy fire from still higher positions. On the night of the 23d, the 9th Marines made good progress moving through more open territory which was dotted by hills, each of which was a potential enemy bastion. A patrol sent south along the shoreline to contact the 1st Brigade took fire from the hills to its left and ran into an American artillery and naval gunfire concentration directed at Orote’s defenders. The patrol was given permission to turn back. Mount Alifan looms over the men of the 4th Marines as they move through the foothills to the attack. In the background, a plane being used for observation keeps track of the front lines for controlling the fire of ships’ guns and supporting artillery. On the 24th, the 3d and 21st Marines finally made contact on the heights, but the linkup was illusory. There were no solid frontlines, only strongpoints. No one could be certain that the Japanese had all been accounted for in the areas that had been probed, attacked, and now seemed secure. Every rifleman was well aware that more of the same lay ahead; he could see his next objectives looming to the front, across the Mount Tenjo Road, which crossed the high ground that framed the beachhead. Already the division had suffered more than 2,000 casualties, the majority in infantry units. And yet the Japanese, who had lost as many and more men in the north alone, were showing no signs of abandoning their fierce defense. General Takashina was, in fact, husbanding his forces, preparing for an all-out counterattack, just as the Marines, north and south, were getting ready to drive to the force beachhead line (FBHL), the objective which would secure the high ground and link up the two beachheads. Since the American landings, Takashina had been bringing troops into the rugged hills along the Mount Tenjo Road, calling in his reserves from scattered positions all over the island. By 25 July, he had more than 5,000 men, principally of the 48th Independent Mixed Brigade and the 10th Independent Mixed Regiment, assembled and ready to attack. 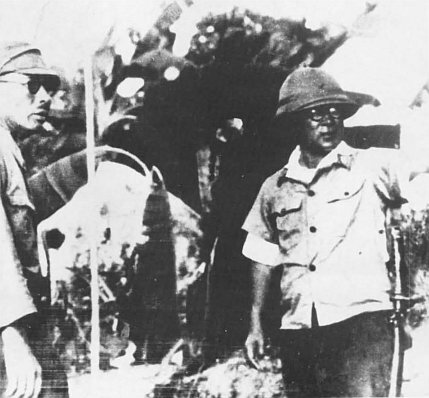 Prior to the anticipated American landing on 21 July 1944, LtGen Takeshi Takashina, right, commanding general of the 29th Infantry Division, inspects defenses on Agat Beach, with Col Tsunetaro Suenaga, who commanded the 38th Infantry. The fighting on the 25th was as intense as that on any day since the landing. The 2d Battalion, 9th Marines (Lieutenant Colonel Robert E. Cushman, Jr., who was to become the 25th Commandant of the Marine Corps in 1972), was attached to the 3d Marines to bring a relatively intact unit into the fight for the Fonte heights and to give the badly battered21 1st Battalion, 3d Marines, a chance to rest and recoup. By nightfall, Cushman’s men had driven a salient into the Japanese lines, seizing the Mount Tenjo Road, 400 yards short of the Fonte objective on the left and 250 yards short on the right. 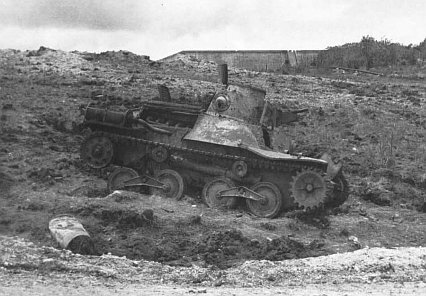 During the Japanese counterattack on the night of 21–22 July, this Japanese light tank was destroyed at the Company B, 4th Marines, roadblock. Note the rubble of the ground thrown up by U.S. artillery, aerial, and ships’ gunfire bombardments. During the day’s relentless and increasingly heavy firefights, the 2d and 3d Battalions of the 3d Marines had blasted and burned their way through a barrier of enemy cave defenses and linked up with Cushman’s outfit on the left. About 1900, Company G of the 9th Marines pulled back some 100 yards to a position just forward of the road, giving it better observation and field of fire. Company F had reached and occupied a rocky prominence some 150 yards ahead of Companies G and E, in the center of the salient. It pulled22 back a little for better defense, and held. Thus the scene was set for the pitched battle of Fonte Ridge, fought at hand-grenade range and in which casualties on both sides were largely caused by small arms fire at point-blank distances. It was in this action that leadership, doggedness, and organizational skill under fire merited the award of the Medal of Honor to the Commanding Officer of Company F, Captain Louis H. Wilson, Jr., who became the 26th Commandant of the Marine Corps in 1976, following in the footsteps of his former battalion commander. In the aftermath of the Japanese counterattack, bodies of the attackers were strewn on a hillside typical of the terrain over which much of the battle was fought. 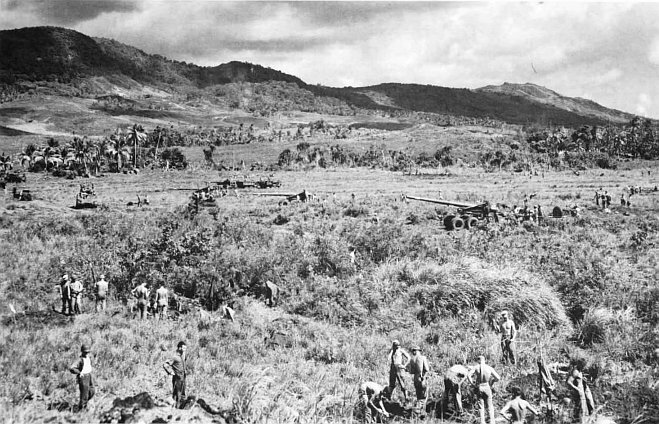 Long Toms of Battery A, 7th 155mm Gun Battalion, III Corps Artillery, were set up in the open 500 yards from White Beach 2 in the shadow of the mountain range secured by the 4th Marines and the Army’s 305th Infantry after heavy fighting. Captain Wilson organized and led the 17-man patrol which climbed the slope in the face of the same continued enemy fire to seize the critical high ground at Fonte and keep it. A half century later, Colonel Fraser E. West recalled the engagement at Fonte as bitter, close, and brisk. As a young officer, he commanded Company G, and reinforced Wilson’s unit. West joined on Company F’s flank, then reconnoitered to spot enemy positions and shared the night in a common CP with Captain Wilson. In late afternoon of the 25th, a platoon of four tanks of Company C, 3d Tank Battalion, had made its way up to the Mount Tenjo Road and gone into position facing the most evident Japanese strongpoints. At the height of the battle by Wilson’s and West’s companies to hold their positions, First Lieutenant Wilcie A. O’Bannon, executive officer of Company F, managed to get down slope from his exposed position and bring up two of these tanks. By use of telephones mounted in the rear of the tanks to communicate with the Marines inside, Lieutenant O’Bannon was able to describe targets for the tankers, as he positioned them in support of Wilson’s and West’s Marines. West recalled the tanks came up with a precious cargo of ammunition. He and volunteers stuffed grenades in pockets, hung bandoleers over their shoulders, pocketed clips, carried grenade boxes on their shoulders, and delivered them all as they would birthday presents along the line to Companies G and F and a remaining platoon of Company E. Major West was also able to use a tank radio circuit to call in naval gunfire, and guarantee that the terrain before him would be lit all night by star shells and punished by high explosive naval gunfire. On the morning of 26 July, 600 Japanese lay dead in front of the 2d Battalion, 9th Marines positions. But the battle was not over. General Turnage ordered the military crest of the reverse slope taken. There would be other Japanese counterattacks, fighting would again be hand-to-hand, but by 28 July, the capture of Fonte was in question no longer. Companies E, F, and G took their objectives on the crest. Lieutenant Colonel Cushman’s battalion in four murderous days had lost 62 men killed and 179 wounded. The 9th Marines under Colonel Craig made good progress on the 25th from its morning jump-off and reached the day’s objective, a line running generally along the course of a local river (the Sasa) by 0915. The 9th Marines had taken even more ground than was planned. General Turnage was then able to reposition the 9th Marines for the harder fighting on the beleaguered left. The 2d Battalion pulled out of position to reinforce the 3d Marines and the remaining two battalions spread out a little further in position. The determined counterattack that hit the 3d Marines on the night of 25–26 July was matched in intensity all across the 3d Division’s front. It wasn’t long before there were enemy troops roaming the rear areas as they slipped around the Marine perimeters and dodged down stream valleys and ravines leading to the beaches. With the dark came heavy rain. Up on the line Marines huddled under ponchos in their wet foxholes trying to figure out the meaning of the obvious activity on the part of the opposing Japanese. Around midnight there was enemy probing of the lines of the 21st [Marines], and slopping over into those of the 9th [Marines].... All was quiet in our circle of hills and we received no notification when the probing increased in intensity or at 0400 when the enemy opened ... his attack.... My first inkling came at about 0430 when my three companies on the hills erupted into fire and called for mortar support. I talked to the company commanders and asked what was going on to be told that there were Japanese all around them ... the Japanese had been close. Three of my dead had been killed by bayonet thrusts. At about 0400, the Japanese troops poured down the slopes in a frenzied banzai attack. Japanese troops had been sighted drinking during the afternoon in the higher hills, and some of these attackers appeared drunk. Marine artillery fire had immediately driven them to cover then, but they apparently continued to prepare for the attack. In the area of the 21st Marines,25 along a low ridge not far from the critical Mount Tenjo Road, the human wave struck hard against the 3d Battalion and the Japanese actually seized a machine gun which was quickly recaptured by the Marines. The 3d Division was holding a front of some 9,000 yards at the time, and it was thinnest from the right of the 21st Marines to the left of the 9th Marines. Much of that line was only outposted. The 3d Battalion, 21st Marines, held throughout. Some of the raiders got through the weakly manned gap between the battalions. They charged harum-scarum for the tanks, artillery, and ammunition and supply dumps. The attack seemed scattered, however, and unorganized. The fighting was fierce, nonetheless, and it shattered the hastily erected Marine roadblock between the battalions. Some of the attackers got through the lines all along the front. A group of about 50 reached the division hospital. Doctors evacuated the badly wounded, but the walking wounded joined with cooks, bakers, stretcher bearers, and corpsmen to form the line that fought off the attackers. One of the patients, Private First Class Michael Ryan, “grabbed up the blanket covering me and ran out of the building without another stitch on.” He had to run with a wounded foot through crossfire to reach some safety. Lieutenant Colonel George O. Van Orden (3d Division infantry training officer), on orders from General Turnage, assembled two companies of the 3d Pioneer Battalion to eliminate this threat. In three hours the pioneers killed 33 of the assailants and lost three of their own men. The 3d Medical Battalion had 20 of its men wounded, but only one patient was hit and he was one of the defenders. We set up where a road made a sharp turn overlooking a draw. It was the last stand of the second platoon. There were three attacks that night and by the third there was nobody left to fight, so they broke through. They came in droves throwing hand grenades and hacked up some of our platoon. In the26 morning, I had only ten rounds of ammunition left, half the clip for my BAR. I was holding those rounds if I needed them to make a break for it. I had no choice. Everybody was quiet, either dead or wounded. The Japanese came in to take out their dead and wounded, and stepped on the edge of my foxhole. I didn’t breath. They were milling around there until dawn then they were gone. With the seizure of Fonte Hill, the capture of the beachhead was completed. 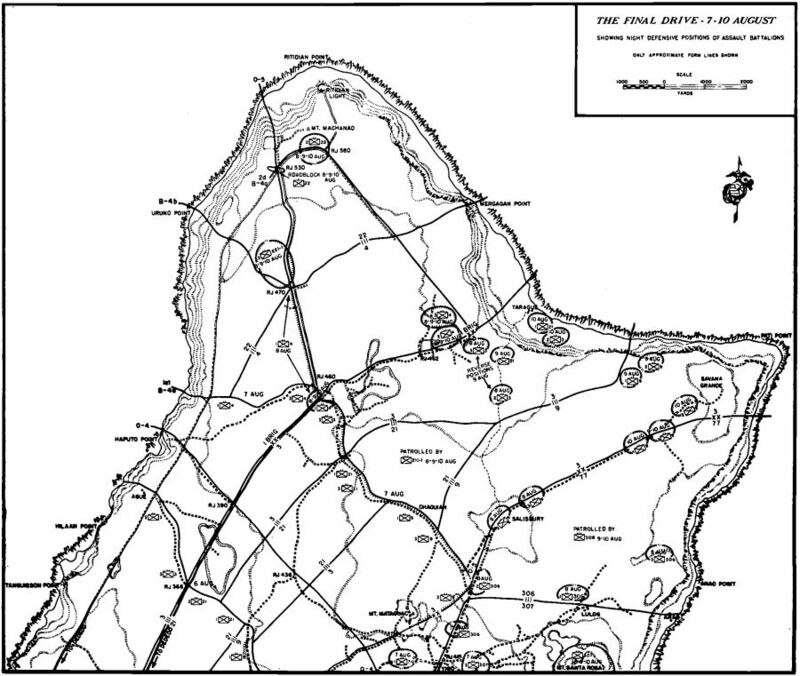 In the large picture, the defeat of the large counterattack on the 26th by the many battalions of the 3d Division who fought valiantly through the bloody night finished the Jap on Guam.... What made the fighting for Fonte important was the fact that [the advance to the north end of the island] could not take place until it was seized. The enemy attack failed in the south also, and in the south it was just as much touch and go at times. The Japanese sailors on Orote were just as determined as the soldiers at Fonte to drive the Americans from Guam. General Cushman became the 25th Commandant of the Marine Corps on 1 January 1972. Interestingly enough, he was succeeded four years later by General Louis H. Wilson, Jr., who commanded a company in Cushman’s 2d Battalion, 9th Marines, on Guam. The Colt M1911A1 pistol was standard issue to many Marine officers, noncommissioned officers, and specialists not armed with either the M1 carbine or rifle during World War II. From 1911, this pistol served its Marine owners as well as members of the other U.S. services armed with it. The first M1911 pistols were issued to the Marine Corps in 1912, and shortly afterwards the Corps was able to field this pistol exclusively. Although Colt manufactured more than 55,000 pistols by the time the United States entered World War I, not enough were on hand to preclude arming some units of the American Expeditionary Force with revolvers. Subsequently, more than a half million M1911s were produced before 1926, when the M1911 was modified and the revised pistol now dubbed the M1911A1. These modifications included a shorter, and serrated, trigger; wider sights; a contoured handgrip; and a longer grip safety. Approximately 1.8 million of the newer M1911A1s were produced and the M1911s also were upgraded to meet these new specifications during World War II. The advent of World War II also meant further changes for the pistol. Among these was altering the finish from the common shiny blue-black to a dull gray, in the process called “Parkerization,” which was designed to give the pistol a nonreflective matte surface. Wartime M1911A1s also sported checkered plastic grips instead of molded rubber. Colt could not keep up with wartime demand, and the following firms were licensed to produce the M1911A1: Remington Arms Company, North American Arms Company Limited, Remington-Rand Company, Ithaca Gun Company, Union Switch and Signal Company, and Singer Sewing Machine Company. One curious note is that the Remington-Rand Company actually outproduced Colt during the wartime years by approximately 500,000 pistols. During the war, in its table of equipment, a Marine division rated 1,707 pistols, but the actual number it had was in general substantially higher; a tribute to the popularity of the M1911A1. A number of Marine aviators, given the option, chose the .45-caliber Colt over the .38-caliber Smith & Wesson “Victory” revolver. The 22d Marines had driven up the coast from Agat in a series of hard-fought clashes with stubborn enemy defenders. The 4th Marines had swept up the slopes of Mount Alifan and secured the high ground overlooking the beachhead. By the 25th, the brigade was in line across the mouth of Orote Peninsula facing a formidable defensive line in depth, anchored in swamps and low hillocks, concealed by heavy undergrowth,27 and bristling with automatic weapons. 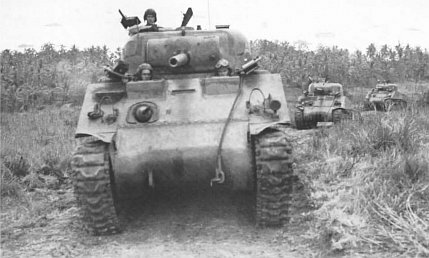 Sherman mediums from the 3d Tank Battalion lumber up the long incline from the Asan beachhead towards the scene of battle around Fonte and X-Ray Ridges. The 77th Infantry Division had taken over the rest of the southern beachhead, relieving the 4th Marines of its patrolling duties to the south and in the hills to the west. The division’s artillery and a good part of the III Corps’ big guns hammered the Japanese on Orote without letup. Just in case of enemy air attack, the beach defenses from Agat to Bangi Point were manned by the 9th Defense Battalion. There were not too many Japanese planes in the sky, and so the antiaircraft artillerymen could concentrate on firing across the water into the southern flank of the enemy’s Orote positions. 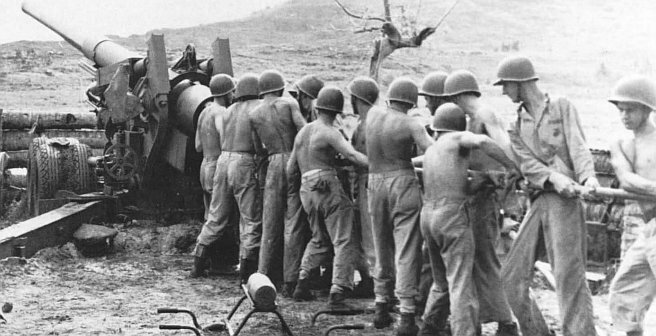 On Cabras Island, the 14th Defense Battalion moved into position where it could equally provide direct flanking fire on the peninsula’s northern coast and stand ready to elevate its guns to fire at enemy planes in the skies above. The 5,000 Japanese defenders on Orote took part in General Takashina’s all-out counterattack and it began in the early morning hours of 26 July. The attackers stormed vigorously out of the concealing mangrove swamp and the response was just as spirited. Here, as in the north, there was evidence that some of the attackers had fortified themselves with sake and there were senseless actions by officers who attacked the Marine tanks armed only with their samurai swords. There were deadly and professional attacks as well, with Marines bayoneted in their foxholes. There was one attendant communications breakdown obliging Captain Robert Frank, commanding officer of Company L, 22d Marines, to remain on the front relaying artillery spots to the regimental S-2 and thence to brigade artillery. Stretchers for wounded Marines lie scattered among the bodies of Japanese dead in the wake of the attack on the 3d Division hospital the evening of 25–26 July. Doctors, corpsmen, and wounded Marines joined in the fight to repulse the enemy. The artillery response was intense and effective. The fire was “drawn in closer and closer toward our front lines; 26,000 shells were thrown into the pocket [of attackers] between midnight and 3 a.m.” The screaming attacks came at 1230, then again at 0130, and at 0300. At daylight the muddy ground in front of the Marine positions was slick with blood. More than 400 Japanese bodies were sprawled in the driving rain. General Shepherd, secure in the knowledge that his frontline troops, 4th Marines on the left, 22d Marines on the right, had withstood the night’s banzai attacks in good order, directed an attack to be launched at 0730. But first there would be another artillery preparation. At daybreak it opened with the 77th Infantry Division’s 105s and 155s, the brigade’s 75s, the defense battalion’s 90s, and whatever guns the 12th Marines could spare. It was one of the more intense preparations of the campaign. Major Charles L. Davis, S-3 of 77th Division Artillery, recalled how, on the request of General Shepherd, he had turned the heavy 155mm battalion and two 105mm battalions around to face Orote to soften the Japanese positions. The 155s and 105s battered well-prepared positions, and ripped the covering, protection, and camouflage from bunkers and trenches. Pieces of men soon hung in trees. Marines saw that this fire counted and made it a point to return to congratulate and thank the 77th’s artillery section leaders. The advance, when it came, only went 100 yards before it was addressed by a blistering front of machine gun and small arms fire. Enemy artillery fire came falling almost simultaneously with the cessation of American support, leaving the Marines to think the fire was from their own guns, a favorite Japanese ruse. For a moment there, the Japanese return fire on the 22d Marines disorganized its forward move. It was about 0815 before the attack was on again in full force, spearheaded by Marine and Army tanks. 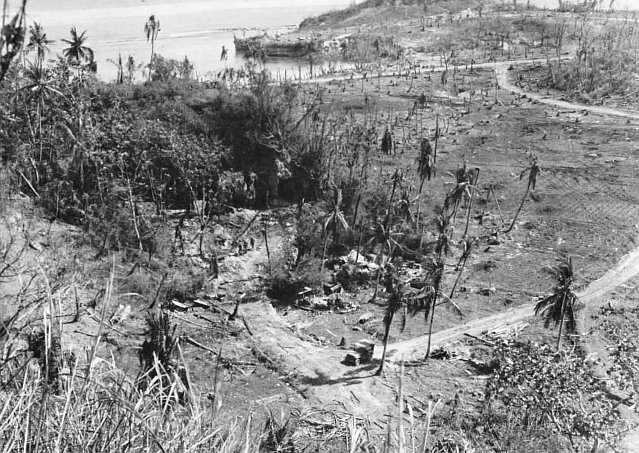 Immediately to the front of the 22d Marines was the infernal mangrove swamp from where the banzai attack had been mounted the night before. It was still manned heavily by Japanese, was dense, and the only means of penetrating it was by a 200-yard-long corridor along the regimental boundary which was covered by Japanese enfilade fire and could only be navigated with the cover of tanks. The armor gunners and commanders directed their fire just over the head of prone Marines and into the gunports of enemy pillboxes. By 1245, Colonel Schneider’s regiment had worked its way through all bottlenecks past the mangrove swamps, destroying bunkers with demolitions and flamethrowers. The 4th’s assault battalions kept pace with this advance, finding somewhat easier terrain but just as determined defenders. By evening the brigade had advanced 1,500 yards from its jump-off line. Both regiments, weary, wary, and waiting, dug in with an all-around defense. Again, there was a heavy pre-attack barrage on the 27th and the Marines were stopped again before they’d gone 100 yards. The 3d Battalion,29 4th Marines, facing a well-defended ridge, a coconut grove, and a sinister clearing, was nearing the sentimental and tactically important goals of the old Marine barracks, its rifle range, and the runways of Orote airfield. With heavy tank support, the 22d Marines surged forward past the initial obstacles and by afternoon had reached positions well beyond the morning’s battles. On the left of the 4th Marines, where resistance was lighter, the assault was led by tanks that beat down the brush. 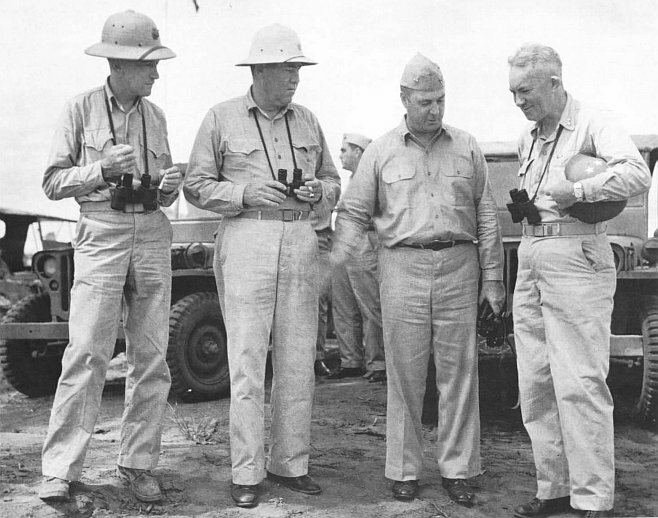 While inspecting positions there, Lieutenant Colonel Samuel D. Puller, the 4th’s executive officer and brother of famed Lieutenant Colonel Lewis B. “Chesty” Puller, was killed by a sniper. By mid-afternoon, the 4th Marines’ assault elements broke out of the grove just short of the rifle range, only to stall in a new complex at dug-in defenses and minefields. Strangely, and yet not unusual in the climax of a losing engagement, a Japanese officer emerged to brandish his sword at a tank. It was easier than ritual suicide. The horror of the American guns again must have been too much for the Japanese defending the immediate front. Surprisingly, they just cut and ran from their strong, well-defended positions. The elated Marines, who did not care why the enemy ran—just that they ran—now dug in only 300 yards from the prized targets. Their capture would wait for tomorrow, 28 July. The Japanese were now squeezed into the last quadrant of the peninsula. All of their strongly entrenched defenses had failed to hold. The Orote airfield, the old Marine barracks, the old parade ground which had not felt an American boot since 10 December 1941, were all about to be retrieved. General Shepherd sounded a great reveille on 28 July for what was left of the Japanese naval defenders: a 45-minute air strike and a 30-minute naval gunfire bombardment, joined by whatever guns the 77th Division, brigade, and antiaircraft battalions could muster. At 0830 the brigade would attack for Orote airfield. Colonel Schneider’s 22d Marines would take the barracks and Sumay and Colonel Shapley’s 4th Marines would take the airfield and the rifle range. Japanese artillery and mortar fire had diminished, but small arms and machine guns still spoke intensely when the Marines attacked. At this bitter end, the Japanese were evoking a last-ditch stubbornness. American tanks were called up but most had problems with visibility and control. 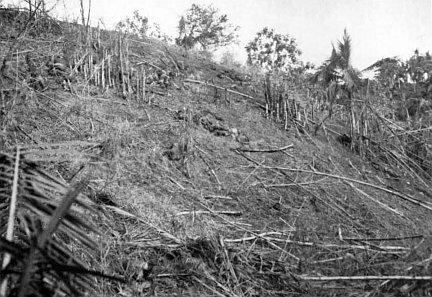 Wherever the thick scrub brush concealed the enemy,30 Major John S. Messers’ 2d Battalion, 4th Marines called for increased tank support when one of his companies began taking heavy casualties. In response to General Shepherd’s request, General Bruce sent forward a platoon of Army tank destroyers and a platoon of light tanks to beef up the attack. General Shepherd wanted the battle over now. He ordered a massive infantry and tank attack which kicked off at 1530 on the 28th. The Japanese did not intend to oblige this time by quitting; this was do or die. By nightfall all objectives were in plain sight, but there were still a few hundred yards to be gained. The Marines stood fast for the night, hoping the Japanese would sacrifice themselves in counterattack, but no such luck occurred. When the attack resumed on the 29th, after the usual Army and Marine artillery preparation and an awesomely heavy air strike, Army and Marine tanks led the way onto the airfield. Resistance was meager. By early afternoon, the airfield was secured and the 22d Marines had occupied what was left of the old Marine barracks. A bronze plaque, which had long been mounted at the entrance to the barracks, was recovered and held for reinstallation at a future date. The Japanese found this latest advance difficult to accept. Suicides were many and random. Soldiers jumped off cliffs, hugged exploding grenades, even cut their own throats. Many of the Marines standing at attention, watching the historic ceremony, could only thank God that they were still alive. At the end of this ceremony, engineers moved onto the airfield to clear away debris and fill the many shell and bomb holes. Only six hours after the first bulldozer clanked onto the runways, a Navy torpedo bomber made an emergency landing. Soon the light artillery spotting planes were regularly flying from them. The capture of Orote Peninsula had cost the brigade 115 men killed, 721 wounded, and 38 missing in action. The enemy toll of counted dead was 1,633. It was obvious that on Orote as at Fonte, there were many Japanese still unaccounted for and presumably ready still to fight to prevent the island’s capture. In the late summer of 1942, the Marine Corps decided to experiment with the use of dogs in war, which may have been a new departure for the Corps, but not a new idea in warfare. Since ancient times, dogs have served fighting men in various ways. The Romans, for instance, used heavy mastiffs with armored collars to attack the legs of their enemies, thus forcing them to lower their shields. 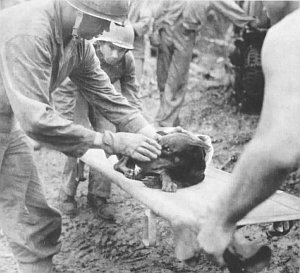 On Guam, First Lieutenant William R. Putney commanded the 1st Dog Platoon and was the veterinarian for all war dogs on Guam. First Lieutenant William T. Taylor commanded the 2d Platoon. Both landed on the Asan-Adelup beach on Guam, while the 1st Platoon under Gunnery Sergeant L. C. Christmore landed with the 1st Provisional Brigade at Agat. Sixty dogs, 90 handlers, 10 NCO assistants, two war dog corpsmen, and three kennelmen were distributed among the regimental and division headquarters of the 3d Marine Division. Lieutenant Putney commanded the 36 handlers and 24 dogs out of division headquarters. Overall, some 350 war dogs served in the Guam operation. Handlers were trained dog specialists and skilled scouts as well. Man and dog searched out the enemy, awaited his coming, and caught him by surprise around the Marine perimeter or while on patrol. In addition, they found snipers, routed stragglers, searched out caves and pillboxes, ran messages, and protected the Marines’ foxholes as they would private homes. The dogs ate, slept, walked, and otherwise lived with their masters. The presence of dogs on the line could promise the Marines there a night’s sleep, for they alerted their handlers when the enemy came near. From the end of the campaign to the end of the war in the Pacific, Guam served as a staging area for war dogs, of which 465 served in combat operations. Of the Marine Corps war dogs, 85 percent were Doberman Pinschers, and the rest mainly German Shepherds. At the end of the Pacific War, the Marine Corps had 510 war dogs. Of this number, 491 were deprogrammed, a process that could take a year, and returned to their owners, given to their handlers, or returned to the Army, which had provided 41 to the Corps. Only four dogs could not be returned to their masters because, even after extensive retraining, they proved “incorrigible” and were considered to be unsafe for civilian life. With the breakthrough at Fonte and failure of Takashina’s mass counterattack, the American positions could be consolidated. 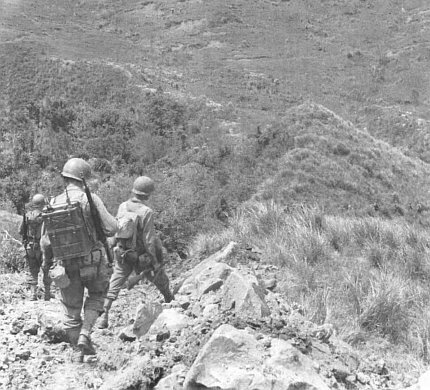 The 3d and 21st Marines squared away their31 holds on heights and the 9th Marines (July 27–29) pushed its final way up to Mount Alutom and Mount Chachao. 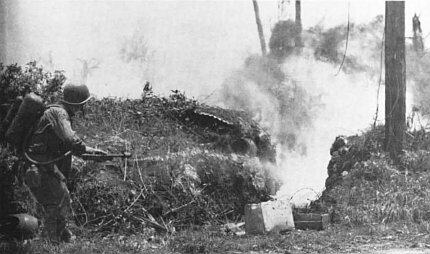 A Marine uses a flamethrower on a Japanese-occupied pillbox on what had been the Marine golf course on Guam, adjoining the Marine Barracks on Orote Peninsula. The most serious resistance to occupying the Mount Alutom-Mount Chachao massif and securing the Force Beachhead Line (FBHL) across the hills was a surprisingly strong point at the base of Mount Chachao. Major Donald B. Hubbard, commanding the 3d Battalion, 9th Marines (replacing Lieutenant Colonel Asmuth, wounded on W-Day), called down artillery, and, after the barrage, his Marines attacked with grenades and bayonets. They destroyed everything that stood in their path. When that fight was over, Major Hubbard’s battalion counted 135 Japanese dead. 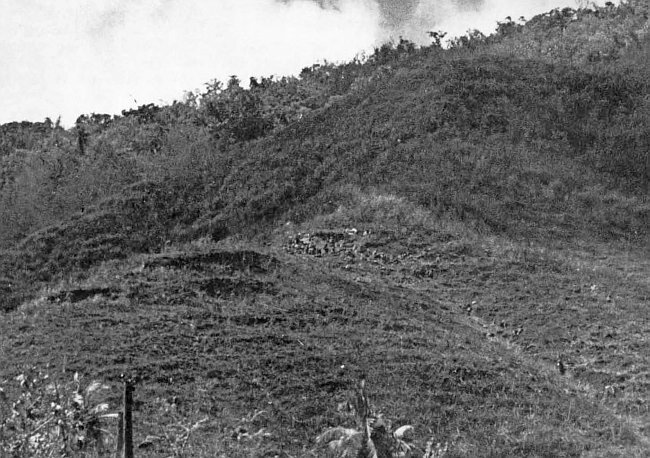 As the assault force pushed up these commanding slopes, the Marines could spot men of Company A of the 305th Infantry atop Mount Tenjo to the west. Lieutenant Colonel Carey A. Randall’s 1st Battalion, 9th Marines, then moved up and made contact with the Army troops. Originally, Mount Tenjo had been in the 3d Division zone, but General Bruce had wanted to get his men on the high ground so they could push ahead along the heights and not get trapped in the ravines. He also wanted to prevent the piecemeal commitment of his division and to preserve its integrity. Conservative estimates put the Japanese dead as a result of the counterattack at 3,200 men. The loss of Takashina’s infantry officers, including General Shigematsu, who had commanded the 48th Independent Mixed Brigade, was held to be as high as 96 percent. 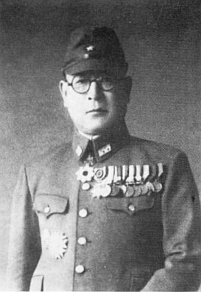 Takashina himself fell to the fire from a machine gun on an American tank as he was urging survivors out of the Fonte position and on to the north to fight again. With Takashina’s death, tactical command of all Japanese forces remaining on Guam was assumed by General Obata. He had only a few senior officers remaining to rally the surviving defenders and organize cohesive units from the shattered remnants of the battalions that had fought to hold the heights above the Asan-Adelup beaches. 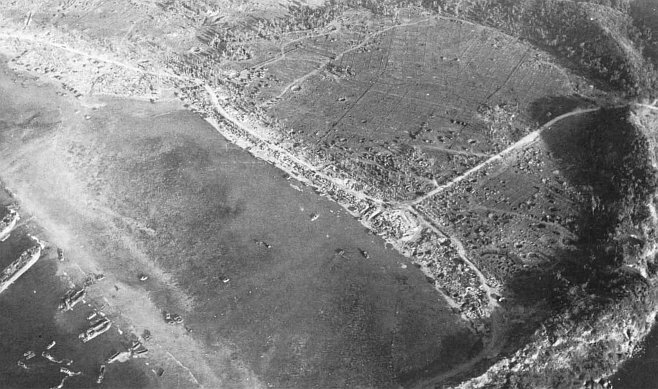 This Japanese airstrip on Orote Peninsula was one of the prime objectives of the 1st Provisional Marine Brigade in its zone. Pockmarks on the strip resulted from the aerial, ships’ gunfire, and artillery bombardments directed at this target. All through the night of 28 July, Japanese troops trudged along the paths that led from Fonte to Ordot, finding their way at times by the light32 of American flares. At Ordot, two traffic control points guided men toward Barrigada, where three composite infantry companies were forming, or toward Finegayan, where a force of five composite companies was to man blocking positions. As he fully expected the Americans to conduct an aggressive pursuit on the 29th, General Obata ordered Lieutenant Colonel Takeda to organize a delaying force that would hold back the Marines until the withdrawal could be effected. A tank-infantry team from the 4th Marines advances slowly through the dense scrub growth that characterized the terrain in the regiment’s zone on Orote Peninsula. The attack moved forward yard by yard until the objective was secured. Contrary to the Japanese commander’s expectations, General Geiger had decided to rest his battle-weary troops before launching a full-scale attack to the north. 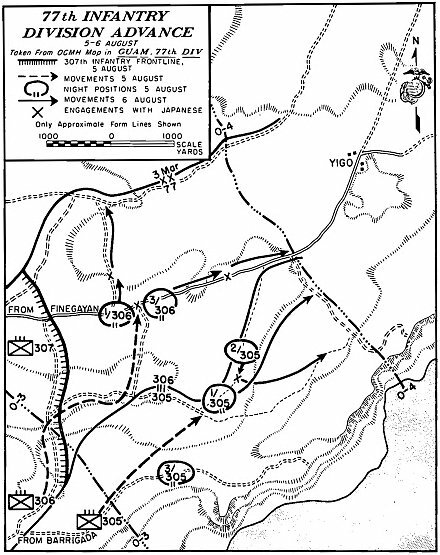 The substance of his orders to the 3d and 77th Divisions on 29 July was to eliminate the last vestiges of Japanese resistance within the FBHL, organize a line of defense, and patrol in strength to the front. With capture of the beachhead line and its critical high ground and the annihilation of great numbers of Japanese, the turning point of the Guam campaign had been reached. Yet, few Japanese had surrendered and those captured were usually dazed, wounded, or otherwise unable to resist. Almost all of the enemy died fighting, even when their lives were lost without sense or purpose. Still, a substantial number of troops from the 29th Division were still not accounted for. General Geiger’s intelligence sections could only list about one quarter of the estimated soldier-sailor strength that had been on the island, and he needed to make certain that his rear was secure from attack before heading north after the enemy. Captured Japanese documents and prisoners of war, and sightings from aircraft, all indicated to Geiger that the Japanese had withdrawn to the north to better roads, denser and more concealing jungle, and commanding terrain for strongpoints. To ensure that his rear area was not threatened, General Geiger had the 77th Division detail patrols to scour the southern half of Guam, repeating and intensifying the searches the brigade had made. These soldiers, as the Marines before them, found Guamanians everywhere, some in camps established by the Japanese, others on their farms and ranches. The natives, some surprised to see Americans so soon after the landings, reported the presence of only small bands of Japanese and often only single soldiers. It became increasingly evident that the combat units that remained were in the north, not the south. The best estimates of their strength ranged around a figure of 6,000 men. Marines of the 1st Provisional Brigade hurl hand grenades at enemy positions on the other side of one of the rice paddies that slowed their advance toward Orote. Obata had expected a hasty pursuit, and set up strong rear guards to give time for his retreating forces to organize. Victory was no longer even a hope, but the Japanese could still extract a painful cost. General Geiger, who had a little time now, could give his troops a rest and move into attack positions across the width of the island. Strong and frequent patrols were sent out to find routes cross33 country and glimpse clues of enemy strength and dispositions. Marines bypass two smoldering Japanese light tanks, knocked out of action by Marine Sherman medium tanks on the road to Sumay on Orote Peninsula. Obata organized delaying defenses to include the southwest slopes of Mount Barrigada, midway across the island from Tumon Bay, and the little town of Barrigada itself, barely 20 houses. On all approaches to his final defensive positions near Mount Santa Rosa, in the northwest corner of the island, he organized roadblocks at trail and road junctions, principally at Finegayan and Yigo, and concealed troops in the jungle to interdict the roads which were the only practical approach routes to the northern end of the island. The Japanese commander felt sorely besieged, and as his notes later revealed: “the enemy air force seeking our units during daylight hours in the forest, bombed and strafed even a single soldier.” Perhaps even more damaging than the air attacks were artillery and naval gunfire bombardments brought down on men, guns, trenches, anything, by the Navy, Marines, and Army spotter planes which were constantly overhead. Marine artillerymen, members of Battery C, 7th 155mm (Long Toms) Gun Battalion, III Amphibious Corps Artillery, take advantage of a lull in fire missions to swab the bore of their gun. Soon after, the gun was back in battery firing missions. III Corps’s Geiger knew Obata’s probable route of retreat and drew up a succession of objectives across the island which would incrementally seize all potential enemy strongpoints. 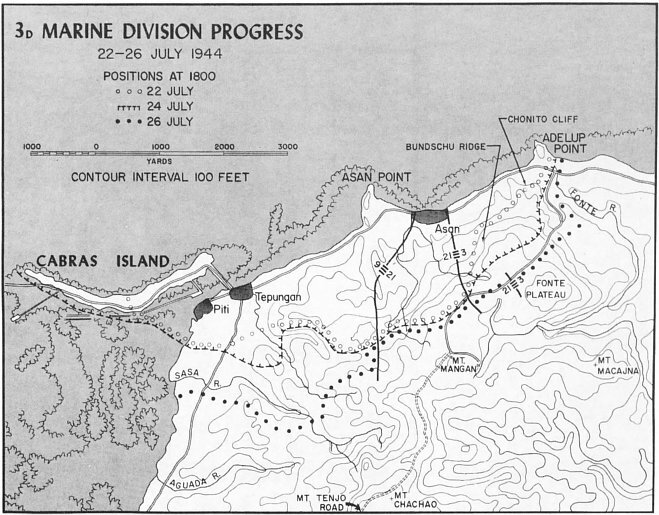 Jump-off for the drive north was 0630 31 July with the 3d Marine Division on the left and the 77th Infantry Division on the right, dividing the island down the middle. The Marine zone would include the island capital of Agana, the Japanese airfield at Tiyan, Finegayan, and the shores of Tumon Bay. The 77th would have Mount Barrigada, Yigo, and Mount Santa Rosa in its zone. The 1st Marine Brigade relieved the 77th Division of the defense of the southern portion of the FBHL and would continue to patrol the southern half of Guam. As the Corps attack moved northward and the island widened, the brigade would eventually take part in the drive to the extreme north coast of the island. Fleet Marine Force, Pacific commander LtGen Holland M. Smith, right, stands with the leaders of the successful retaking of Orote Peninsula. From left to right, LtCol Alan Shapley; BGen Lemuel C. Shepherd, Jr.; and Col Merlin F. Schneider. The 3d Division reached Ordot in the center of its zone where Obata had directed some of his survivors. The 3d Battalion, 21st Marines, ran into them and one of their pillboxes, which the Marines thoroughly gutted. The Americans also accounted for 15 infantrymen and two light tanks which were the targets of M-1s and bazookas. The honor of liberating Agana fell to the 3d Battalion, 3d Marines. The riflemen entered the town’s ruins treading carefully, sizing up the stark, dusty building walls for snipers. A few enemy riflemen emerged from behind concrete outcroppings then dropped back into eternity. The Japanese guards were stragglers, the wounded, or a few foolish enough to stay. In one house, a Marine opened a closet to reveal a Japanese officer, sword in hand. The Marine slammed the door, riddled it with an automatic rifle, and didn’t bother to look again. The once-beautiful old Plaza de Espana was in American hands 15 minutes after the town was entered. By noon it was secured. 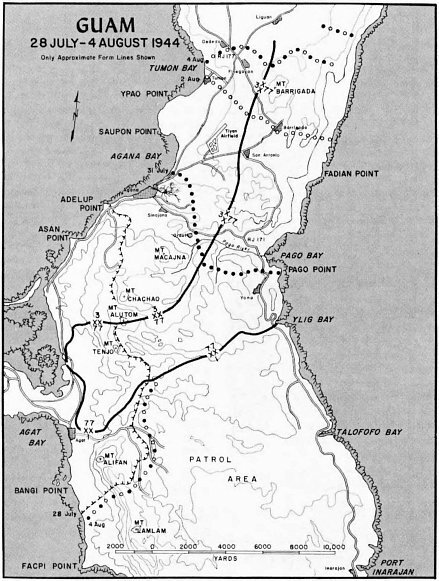 The 1st and 2d Battalions, 3d Marines, moved along to the critical Agana-Pago Road. At 1350 the 21st Marines was right up there with them after the few engagements with pillboxes, snipers, and tanks. By 1510, Colonel Craig’s 9th Marines on the division’s right was partially across the road and seized the remaining portion of that highway in its sector on the next day. Hard-surfaced, with two lanes across the midriff of the island, the Agana-Pago Road would prove critical in winning the battle of Guam. Leaving Agana and its historic rescue of the capital, the 3d Battalion, 3d Marines, under Major Royal R. Bastian, Jr., who had taken command when Lieutenant Colonel Houser was wounded on 22 July, moved on with relative ease. Before dusk the battalion had seized 1,400 yards of other critical roads and trails which led to strategic and defended strongpoints of Finegayan and Barrigada. General Turnage got well within striking distance of the Tiyan airfield and the little town of San Antonio, on the 31st, but the next day, 1 August, his advance was seriously slowed by mines. It took the cool skill and slow and steady hands of the bomb disposal specialists of the 25th Naval Construction Battalion and the 19th Marines’ engineers to reduce those obstacles. As the regimental field music sounds “To the Colors” Col Schneider and his 22d Marines staff and command salute as the American flag is raised over Guam for the first time since it was taken down by the Japanese invaders in December 1941. Students of the battle and those who were there consider the taking of the cross-island Agana-Pago Road as a major factor in guaranteeing the success of the drive northward. Its capture solved a host of logistic35 problems, for the 77th particularly. The Army division, for example, had no roads heading north initially in its zone of advance and needed such a road over which it could supply its troops as they came down out of the hills and cut their way through the jungle. Frontline troops in the Army zone were soon running low on supplies, especially water. General Bruce promised his people a hot breakfast as soon as they and the Marines could give him the road. Trucks were soon thick on the road even while SeaBees and engineers were enlarging and repairing it. Troops of the 3d Battalion, 3d Marines, enter the wreckage of Agana in the trace of retreating Japanese forces, who had planted land mines before they left. The 77th had moved out on schedule just after daylight on 31 July, with the 307th Infantry in the advance, followed by the 305th. As was the situation facing the 3d Division, enemy resistance to the Army advance was negligible. Within two hours, both Army regiments had secured the cross-island road in their zones. The 307th rescued 2,000 Guamanians in the detention camp at Asinan. Unopposed, the 77th by noon of 1 August was across the Pago River. Residents of the area said the Japanese had left in a hurry for Barrigada, a destination where III Corps intelligence already anticipated the enemy would hold up. The jungle-covered mountain there, 674 feet high, dominated the area. General Bruce assigned the capture of Barrigada to the 307th. It was to maintain contact with the 3d Marine Division on the left and push through the town, then continue about a mile to seize Mount Barrigada. The 305th to the right of the 307th would attack in the same direction east of the town and Barrigada mountain and protect to the coast. The town was in a clearing fully swept with defensive machine gun fire. In the same clearing was a much-desired well. Its capture meant the world to the parched troops. Soldiers of the 77th Division reach the end of the road bulldozed by the 302d Engineer Combat Battalion, and strike out cross country in the 31 July advance. At 0630, 2 August General Bruce dispatched a dozen tanks of the 706th Tank Battalion on a reconnaissance. As the “recon” armor turned into36 Barrigada town, the enemy opened up with a torrent of fire. The determined Japanese fiercely resisted the 307th when it reached the town and were equally determined to stop the 305th on the right as that regiment’s assault companies tried to outflank the town. Repeated tank attacks and heavy artillery support netted only a few yards at a time, but the soldiers kept advancing and by 4 August, the 77th Division held the town, or what was left of it, its precious well, and the crest of the mountain. Captured documents and interviews with prisoners again left little doubt that the 77th Division’s major obstacle would be rugged, heavily crevassed, and jungled Mount Santa Rosa. It is six and a half miles northeast of Barrigada and a short distance from the ocean on the east coast. First to be addressed on the way were well-armed outposts like Finegayan and Yigo. Each promised casualties, blood, and delay. General Geiger employed the 77th to reduce Yigo and take Santa Rosa, and left the capture of Finegayan and the rest of northern Guam principally to the 3d Marine Division. He brought up General Shepherd’s brigade to assist in the final drive. To protect the Force Beachhead Line, care for the Guamanians, and hunt down enemy stragglers in the south, General Geiger tasked the 1st Battalion, 22d Marines; the 7th Antiaircraft Artillery Battalion; and the 9th Defense Battalion, all under Lieutenant Colonel Archie E. O’Neil, who commanded the 9th. Before moving on, the brigade had aggressively sought out Japanese holdouts, brought the fearful Guamanians into friendly compounds, and provided security for those who chose to remain in their own homes and again work their own ranches. As late as 2 August, 4th Marines’ patrols approaching Talofofo Bay on the southeast coast, came across some 2,000 natives, still apprehensive of the Japanese, who were directed to a compound which promised safety and at least minimum comforts. The Guamanian people in their own residential and farm areas could, however, still readily call upon the civil affairs sections for food, protection, medicine, and shelter. Such civil care was integral to the American occupation and was controlled by Marine General Larsen, who would head the garrison force as soon as the island was again under the American flag. During the night of 2–3 August, the 12th Marines delivered 777 rounds of harassing and interdictory fire on the roads and trails the division would encounter around Finegayan. At 0700 on 3 August, the 3d and 9th Marines moved in assault well past the Tinyan airfield. Then, about 0910 the 9th encountered a block at the cross roads approaching Finegayan village. The situation and terrain favored the Japanese with excellent fields of fire. 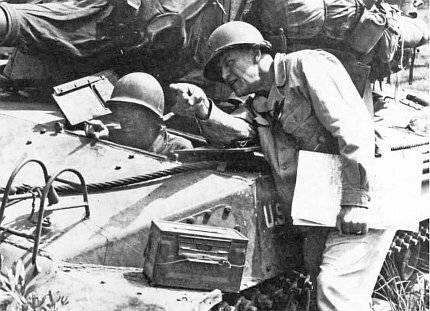 After the Japanese position was finally overrun with tanks, Lieutenant Colonel Carey Randall, commanding 1st Battalion, 9th Marines, said that these defenses were the toughest he had faced on Guam. That contest for Finegayan was the last major battle for the 3d Division on Guam. The Japanese made it something to remember. 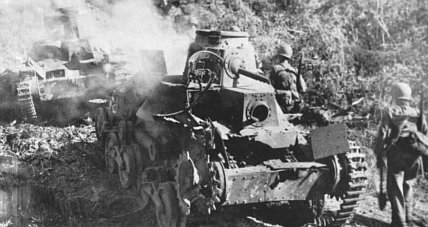 A 3d Division37 armored reconnaissance patrol headed for Ritidian Point on the northernmost point of the island ran into Japanese defenses located on the Finegayan trails bristling with antitank weapons and artillery pointed in the direction of the patrol. The Americans were surprised and bruised, did the Japanese some harm, but sensibly cancelled the mission. 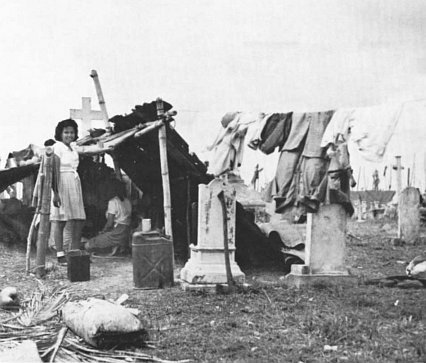 The Catholic cemetery of Anigua became the home of approximately 7,000 Guamanians liberated from Japanese rule. Here a family lives in a temporary shelter. The Japanese were plenty feisty at Finegayan, and in a telling thrust dispatched two medium tanks which skirted the crossroads of the 9th Marines at Junction 177 and went up the Finegayan-Mount Santa Rosa Road. Impervious to Marine fire, the tanks shot up the area and got away. Another tank force of undetermined size then rumbled down under cover of a mortar barrage and it looked like the beginning of a counterattack. Artillery stilled that Japanese effort. The enemy tanks were driven off but survived to reappear again another day. 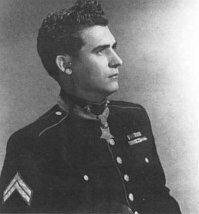 It was in one of those typical sudden enemy attacks around Finegayan that Private First Class Frank P. Witek, with automatic rifle and grenades, raced ahead of his own tanks to destroy an eight-man Japanese position which was holding back elements of his 1st Battalion, 9th Marines. He succeeded, but was killed. He was posthumously awarded the Medal of Honor. On 4 August, the new frontlines and scheme of maneuver were being set up to keep pressure on General Obata and his holdouts, and make a place for General Shepherd and his brigade. During the afternoon, the brigade reached its northern assembly area and General Shepherd set up his CP near San Antonio. In the final advance north, the brigade would be on the left with its inland flank within a mile of the western beaches. The 3d Division would be in the center deploying its units on a three-regiment front which would swerve to the east to take in the whole northern end of the island and as well support38 the 77th Division. The Japanese now faced an overwhelming number of attack forces. And there would be plenty of help from the sea and from the air. General Bruce’s soldiers made the principal corps drive to destroy the remaining Japanese and attacked Mount Santa Rosa. Priority of fires of corps artillery, air support, and ships’ gunfire was now given to the Army. These new arrangements were to take effect on 7 August. During the night of 2–3 August, U.S. artillery delivered many rounds of harassing and interdiction fire on the enemy in the north of Guam. 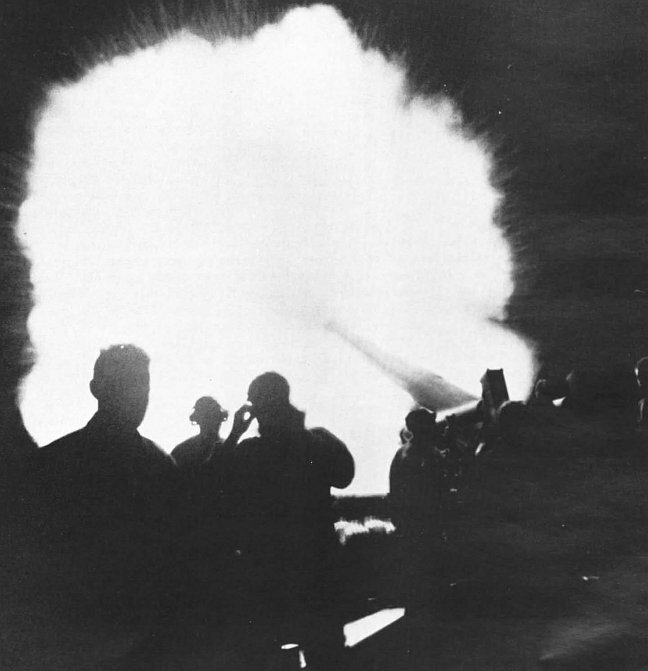 Here, a blinding flash from a Long Tom lights up the dark Guam night as it joins other guns in the shelling. Captured by 1st Brigade Marines, rebuilt by Marine engineers, and in full-scale operation, the Orote Peninsula airstrip is home to Marine Aircraft Group 21 and its Marine Fighter Squadrons 217, 225, and 321, and Marine Night Fighter Squadron 534. Taxiing down the strip are Vought F4U Corsair fighters, while parked off the runway are Grumann F6F Hellcats. Making new strides to end the campaign, the 3d and 21st Marines progressed handily but the 9th Marines kept running into dense jungle that was such a tangled mess that tanks passed each other 15 feet apart without knowing the other was there. The division accelerated its advance in battalion columns. On 6 August, it had progressed 5,000 yards along the road to Ritidian Point, the end of the island and the end of the battle for Guam. As that evening fell, the 3d Division was in visual contact40 with the 77th Infantry Division, wherever the all-encompassing jungle allowed. Meanwhile, heavy Seventh Air Force bombing as well as artillery and naval shelling of enemy areas had been going on for days. Night fighters were now assigned to support the advance, so even darkness afforded the Japanese no protection. By that same 6 August, the defense line that General Obata had set across Guam had been shattered and overrun. Only isolated pockets now existed before Santa Rosa. No American commander could say on 7 August when the fight for Guam would be over. General Bruce in his attack first to Yigo and then Santa Rosa would have a relatively fresh regiment, the 306th, which had come up from the south where it had patrolled with the brigade. It was in contact with the 9th Marines on the division boundary. Colonel Douglas C. McNair, 77th Division chief of staff, was there, too, seeking a site for a division CP and was killed by a sniper. Colonel McNair’s father, Lieutenant General Leslie J. McNair, was killed in France 12 days earlier during an American bombing raid. The attack on Mount Santa Rosa began at noon, 7 August. Behind the rumble of artillery and rattle of tanks, answered in kind by the enemy, the 77th took Yigo, the door to Santa Rosa, and continued General Bruce’s wheeling maneuver. Bulldozers blazed trails, and tanks and infantry overran machine gun positions. 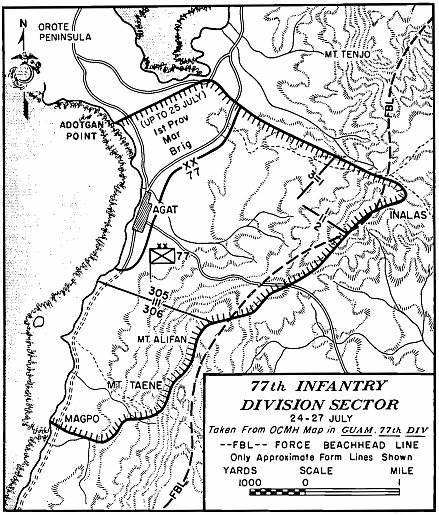 The 77th was dug into positions on the night of 7–8 August ready for the final attack on the mountain. The expected big Japanese counterattack still did not come. The rapid advance of the Americans accompanied by heavy artillery support likely forestalled that forelorn hope. 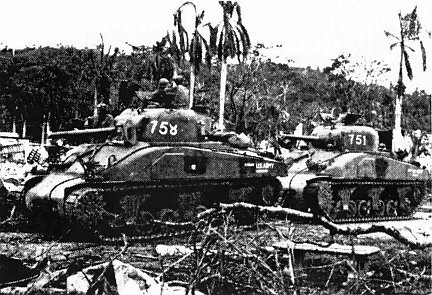 Sherman tanks of the Army 706th Tank Battalion pass through Agana before taking the cross-island road to join the 77th Division prior to the Barrigada action. Two regiments, the 305th and 307th, proceeded rapidly on 8 August. By 1240, the northern half of41 Mount Santa Rosa was in American hands, and the troops moved to secure the rest of the mountain. By 1440 the Army had reached the cliffs by the sea and could look right down to the ocean. The 306th infantry had also completed an enveloping move to take the northern slopes of Mount Santa Rosa. Only 600 enemy bodies were found after the two-day fight for Yigo and Santa Rosa. Yet, estimates of the enemy personnel at Santa Rosa had been as high as 5,000. So this meant that enemy troops in significant number now infested the jungled terrain everywhere on Guam. Worse, some enemy tanks were also unaccounted for. Enemy survivors of the Mount Santa Rosa battle kept drifting into the 9th Marines lines on the Army flank, slowing the regiment’s advance. Sharp-eyed Marines noted more than a smattering of enemy movement near a particular hill in the Army zone. This was believed to be the command post area of General Obata. The 3d Marines on the left of the division’s zone had progressed with the same occasional enemy opposition. A 19-man roadblock held up the Marines, but was taken out quickly. Searching a corridor between the 3d and the 9th Marines, the 21st Marines came upon the bodies of 30 Guamanians near Chaguian. They had been beheaded. The brigade had it a little easier on the far west, for it found negligible resistance as it advanced along fairly good trails. On 8 August, a patrol of the 22d Marines reached Ritidian Point, the northernmost point of the island. Moving along a twisting cliff trail to the beach, the Marines encountered less-than-aggressive Japanese defenses which they quickly overcame. 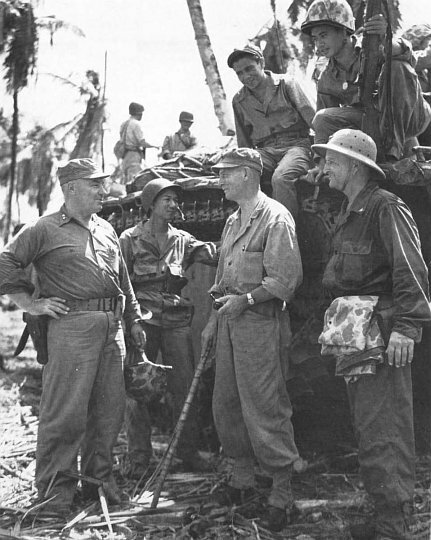 General Shepherd’s 1st Provisional Marine Brigade had the distinction of being first to reach both the southernmost point of the island in the early days of the campaign and the northernmost section of Guam at Ritidian Point at this time. MajGen Henry L. Larsen, left, designated island commander, meets with BGen Lemuel C. Shepherd, Jr., commanding general of the 1st Provisional Marine Brigade, and Col Robert Blake, Gen Larsen’s chief of staff. With them are three Guamanians who enlisted in the Navy before the war and are now visiting their homes. General Shepherd’s Marines began vigorously patrolling the area they occupied, but found few Japanese. 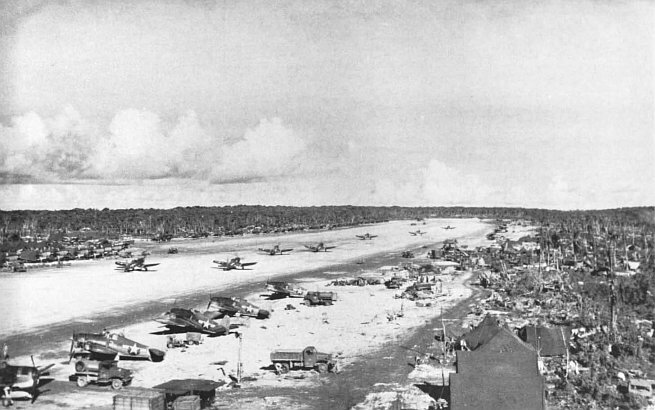 As a result, General Geiger reduced the amount of naval gunfire placed on the area, while Saipan-based Seventh Air Force P-47’s made their last bombing and strafing runs on Ritidian Point. The 22d Marines was down below the cliffs at Ritidian, scouring along the beaches where there are many caves. The 4th Marines was on the north coast at Mengagan Point and tied by patrols to the 22d Marines. At 1800, 9 August, General Shepherd declared organized resistance had ceased in his zone. It was not so easy for the 3d Marines. On the night of 8–9 August near Tarague, the regiment was hit by a last-resort Japanese mortar and tank attack. Marine antitank grenades and bazooka rockets were wet and ineffective and the Japanese blazed away with impunity and then ducked back into the woods. Amazingly, when Major William A. Culpepper, commanding the 2d Battalion (Lieutenant Colonel de Zayas had been killed on 26 July), counted heads, he found that he had suffered not a single casualty. 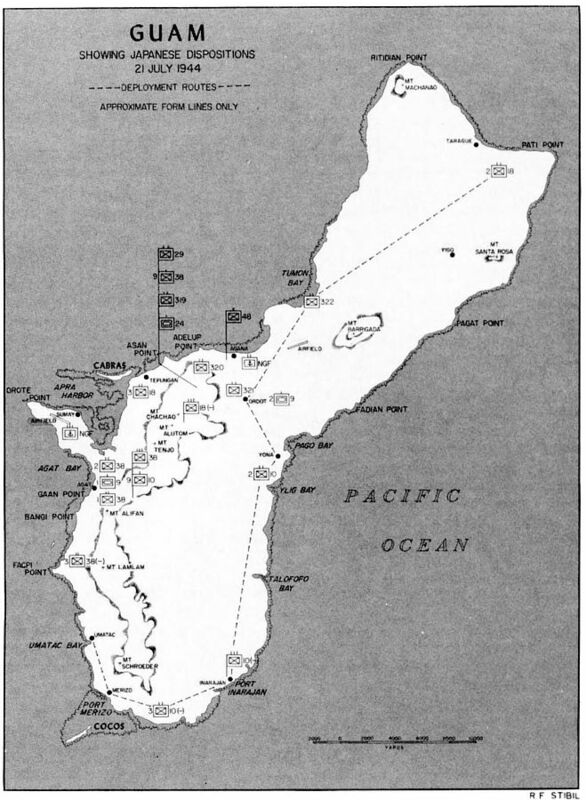 Patrols of the 9th Marines advanced to Pati Point, the northeast projection of the island. Intelligence sources then reported to Colonel Craig that a mass of Japanese (maybe 2,000) troops were holed up at Savana Grand, a wild tract of jungle, coconut trees, and high grasses near the coast. Colonel Craig did not want to risk casualties so close to the end of the campaign, so the artillery supporting the 9th Marines fired a total of 2,280 rounds. The few Japanese survivors were either killed or became prisoners. The final American positions formed along the coast. By nightfall of 8 August, Colonel Craig’s Marines could wave to the soldiers of the 306th patrolling to their south. General Geiger was not ready to declare Guam secure until a pocket of tanks still existing in the 3d Division zone was wiped out. That had to be done by the 10th, for that was the day Admiral Nimitz was scheduled to arrive on a visit. There were tanks indeed and the task of finding and eliminating them was given to Major Culpepper’s 2d Battalion, 3d Marines. Advancing at 0730, the battalion and a platoon of American Sherman tanks soon found two enemy mediums firing, only 400 yards up the trail the Marines were following. The Shermans left their counterparts black and burning. Seven more enemy mediums were abandoned. A Japanese infantry platoon withdrew to the coastal cliffs and was killed there. On that day, 10 August, at 1131 as he learned that the last Japanese tanks still in action had been destroyed, General Geiger declared all organized resistance on Guam had ended. It was a great day for the Guamanians. The island was theirs again. ... We are continuing a desperate battle. We have only our bare hands to fight with. The holding of Guam has become hopeless. Our souls will defend the island to the very end. I am overwhelmed with sorrow for the families of the many officers and men. I pray for the prosperity of the Empire. The 306th made the last assault supported by tanks and demolition squads. The enemy defenders killed seven Americans and wounded 17 before they went down to defeat, buried in the rubble of blown caves and emplacements. General Obata took his own life or was killed sometime during those last hours of the battle of Guam. 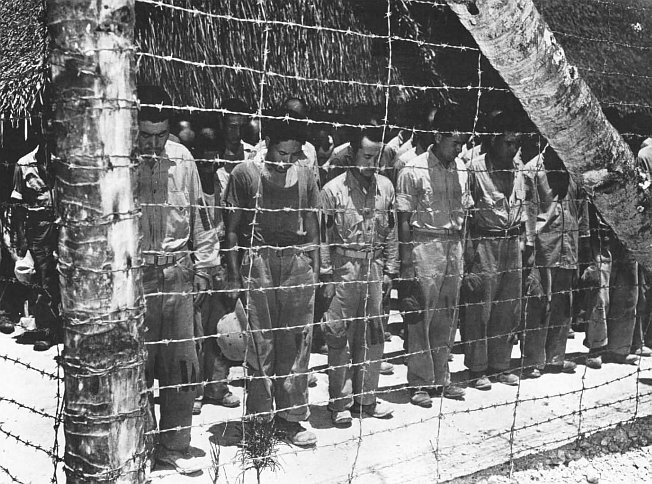 Prisoners of war in the Guam stockade stand with bowed heads as they are read the August 1945 surrender announcement. Major General Henry L. Larsen assumed command of the Guam Island Command at 1200, 15 August. Under him, and largely with the forces of the 3d Marine Division, the mopping up continued. In addition to the battlefield casualties, more than 8,500 Japanese were killed or captured on Guam between August 1944 and the end of44 the war in August 1945. On the same busy day, 10 August, only hours after Major Culpepper’s battalion had knocked out the last of the Japanese tanks, the Indianapolis (CA 35) steamed into Apra Harbor with Marine Corps Commandant Lieutenant General Alexander A. Vandegrift on board, accompanying Admiral Nimitz. On 15 August, Admiral Nimitz directed that his forward CinCPac-CinCPOA headquarters be established on Guam, and from here, he directed the rest of the Pacific War. Soon after, from airfields on Guam, as well as those on Tinian, B-29s were blasting the Japanese home islands. Hard fighting was yet to be experienced by Marine divisions on Peleliu, Iwo Jima, and Okinawa. But whether they knew it or not, the end of the war was less than a year away. The architects of victory in the Pacific met together on Guam on 10 August 1944, when Indianapolis (CA 35) brought Commandant of the Marine Corps LtGen Alexander A. Vandegrift together with Commander in Chief, Pacific Fleet, Adm Chester W. Nimitz and Fifth Fleet Commander Adm Raymond L. Spruance to the island. 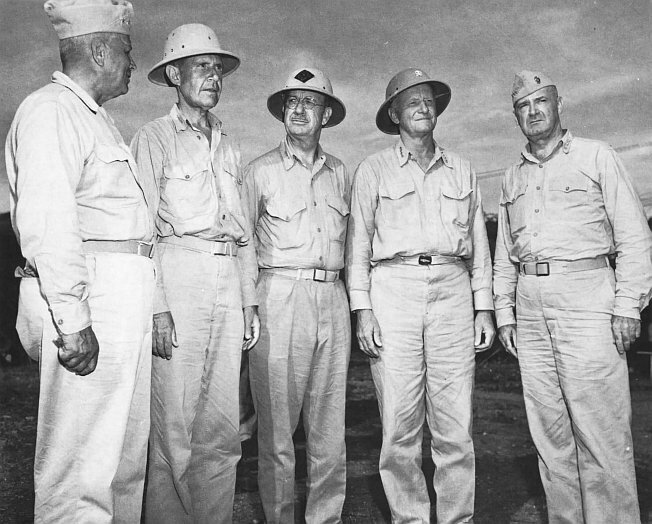 From left are MajGen Roy S. Geiger, Commanding General, III Amphibious Corps; Adm Spruance; LtGen Holland M. Smith, Commanding General, Fleet Marine Force, Pacific; Adm Nimitz; and Gen Vandegrift. While together they discussed the future course of the Pacific War. 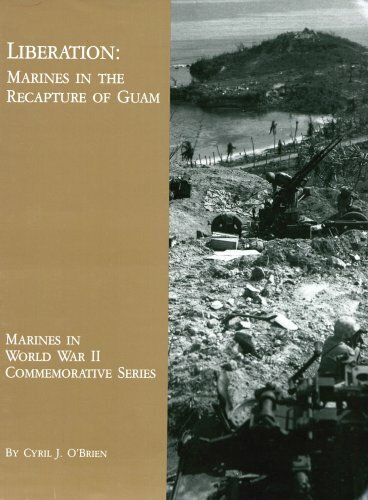 In addition to the official Marine Corps histories of the Guam campaign, Major O. Robert Lodge’s The Recapture of Guam (Washington, 1954), and Henry I. Shaw, Jr., Bernard C. Nalty, and Edwin H. Turnbladh’s Central Pacific Drive, vol III, History of U.S. Marine Corps Operations in World War II (Washington 1966), the author consulted the Army’s official history, Philip A. Crowl’s Campaign in the Marianas (Washington, 1960). Of value also were the 3d Division’s history by Robert A. Aurthur and Kenneth Cohlmia, The Third Marine Division (Washington, 1948), the classic U.S. Marines and Amphibious War by Jeter A. Iseley and Philip A. Crowl (Princeton, 1951), RAdm Samuel Eliot Morison’s The Two Ocean War (Boston, 1976), The Fall of Japan by William A. Craig (New York, 1967), and LtGen Victor H. Krulak’s First to Fight (Annapolis, 1984). Historians at all the Services’ Washington historical offices were universally helpful, but I would particularly like to thank Dr. Terrence J. Gough of the Army’s Center of Military History and Dr. Robert Browning, the Coast Guard historian for their assistance. Conversations and correspondence, and oral history interviews, with the following were helpful: Jack Kerrins; MajGen Charles L. Davis, AUS (Ret); BGen Vincente (Ben) Blaz, USMC (Ret); Col Martin J. “Stormy” Sexton, USMC (Ret); Col Fraser E. West, USMC (Ret); LtCol Wilcie A. O’Bannon, USMC (Ret); Col Henry Aplington II, USMC (Ret); Dr. William H. Putney; Dale M. Quillan; William L. Dunlap; Paul Ulrich; and Alfred G. Don. Even if their words were not used, their thoughts and observations were carefully considered. 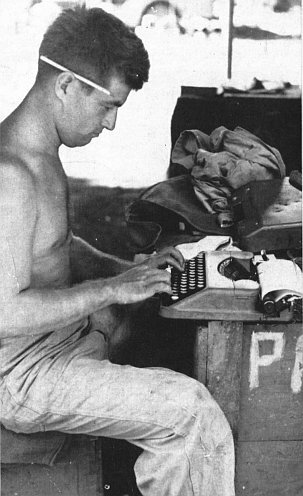 The author’s own experiences on Guam as a Marine combat correspondent pervaded his whole account. Cyril J. O’Brien served in a line company with the 3d Marines, 3d Marine Division, on Bougainville, and then as a Combat Correspondent in the battles for Guam and Iwo Jima. 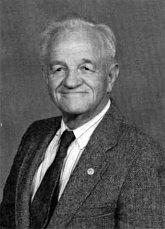 Following World War II, he covered Capitol Hill as a Washington correspondent, then joined the staff of the Johns Hopkins University Applied Physics Laboratory where he was a science writer and supervisor of media relations. He attended St. Joseph’s University, Philadelphia, and the American University, Washington, D.C. He lives in Silver Spring, Maryland. THIS PAMPHLET HISTORY, one in a series devoted to U.S. Marines in the World War II era, is published for the education and training of Marines by the History and Museums Division. 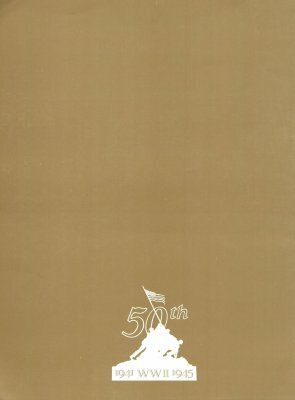 Headquarters, U.S. Marine Corps, Washington, D.C., as a part of the U.S. Department of Defense observance of the 50th anniversary of victory in that war.